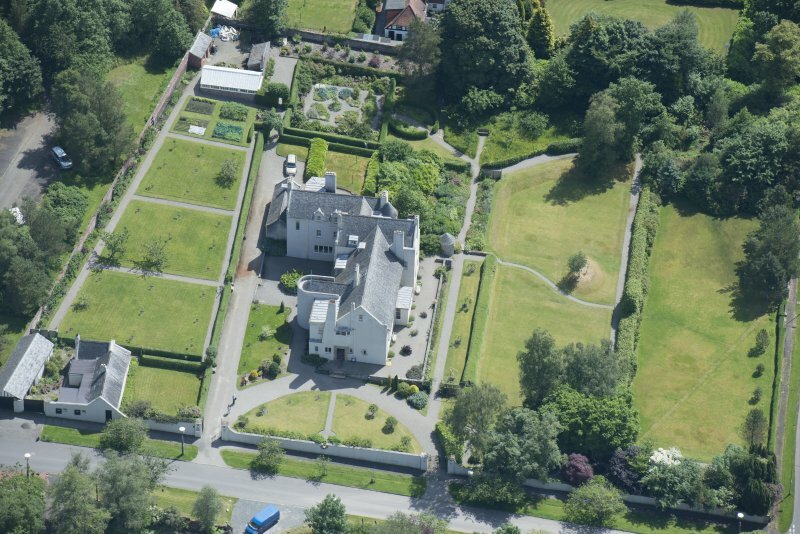 Oblique aerial view of Helensburgh, centred on the Hill House, taken from the NW. 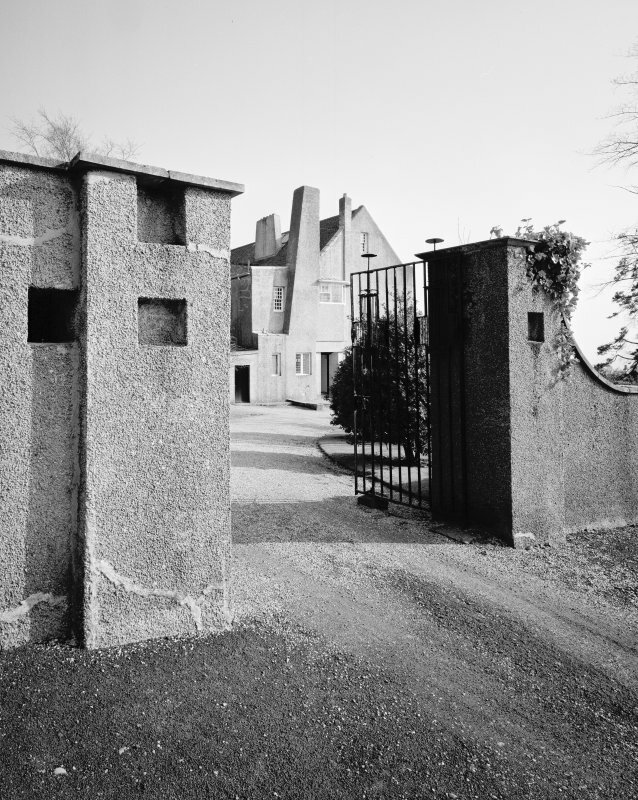 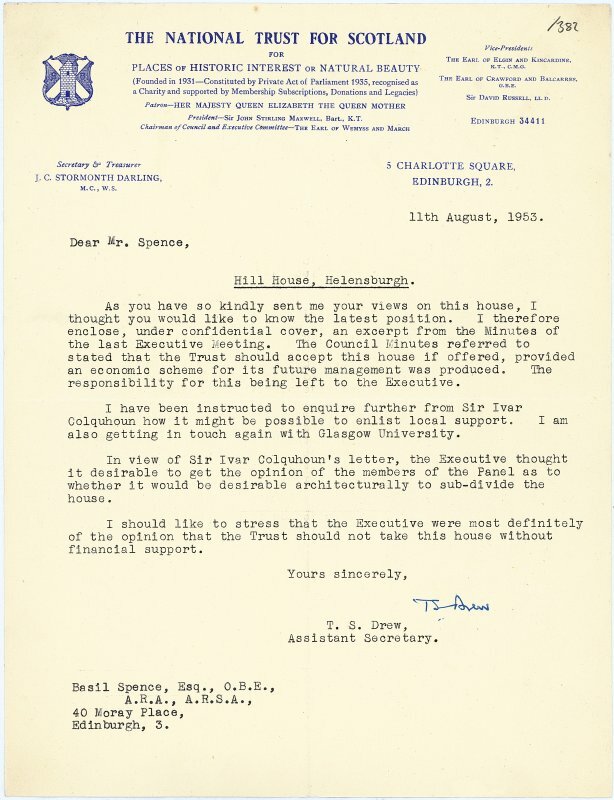 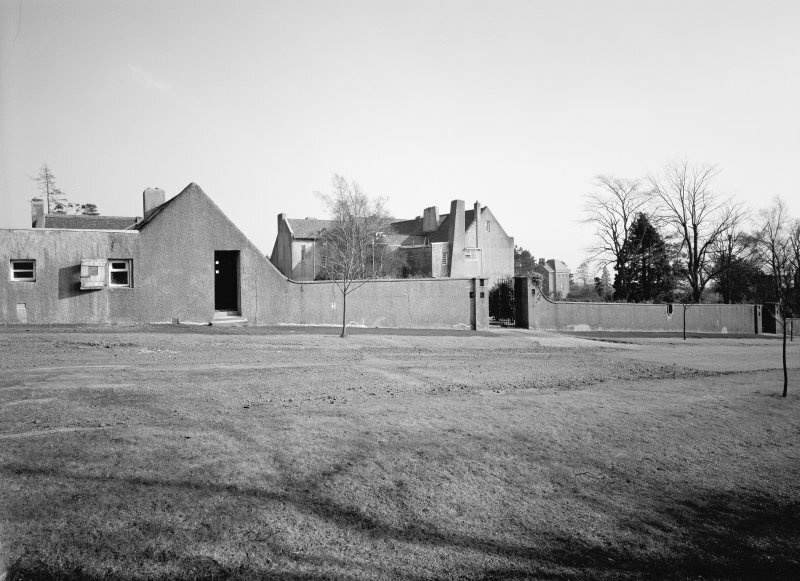 Letter from the National Trust of Scotland to Basil Spence relating to Hill House, Helensburgh. 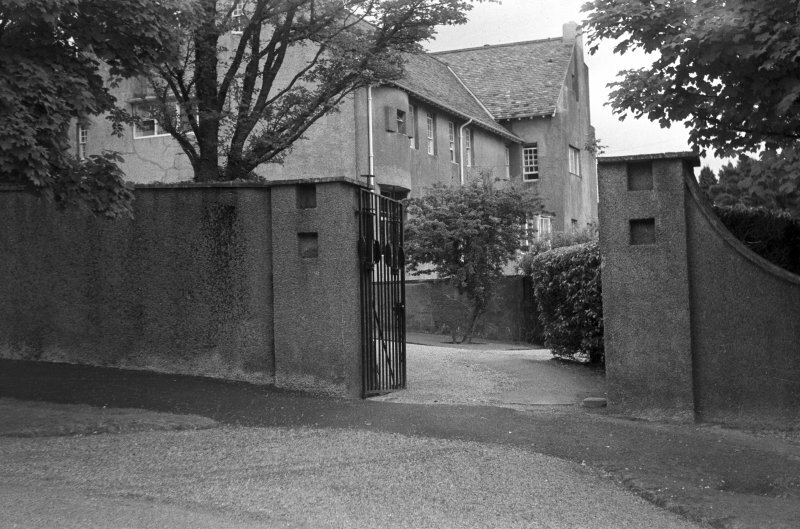 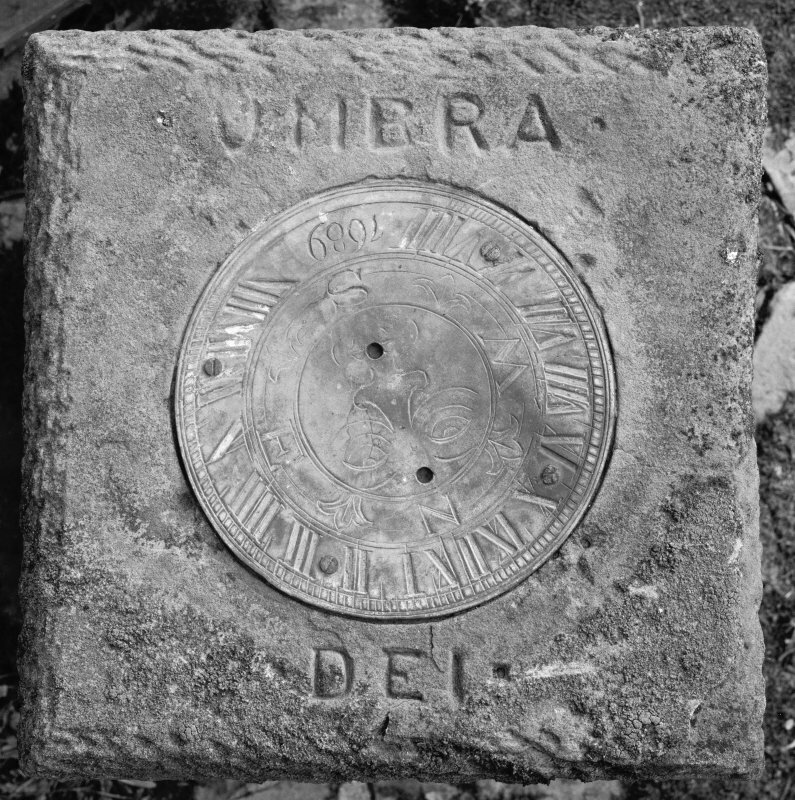 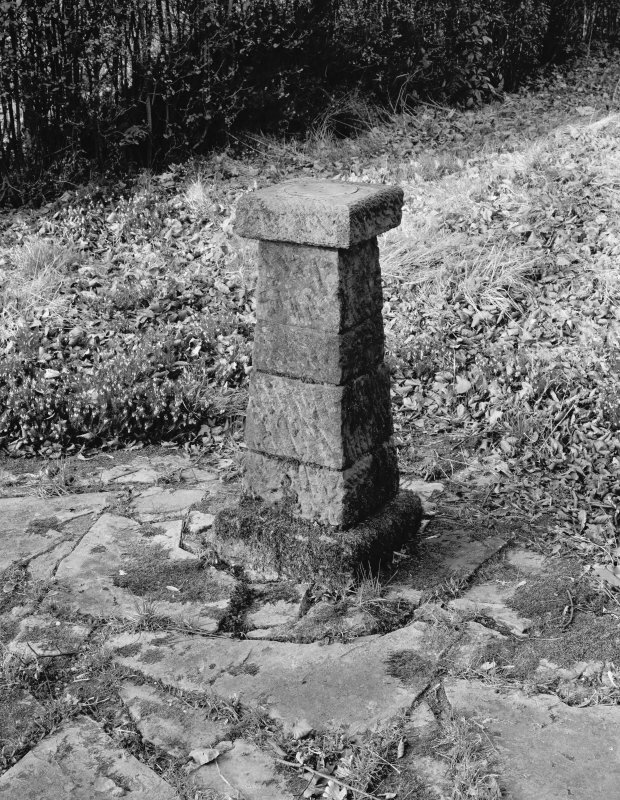 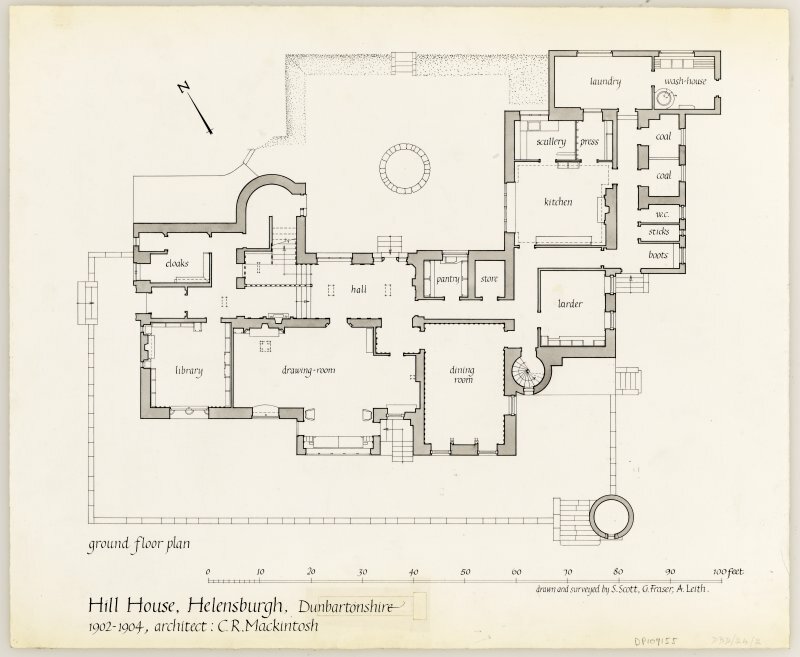 Dumbartonshire, Helensburgh, Hill House. 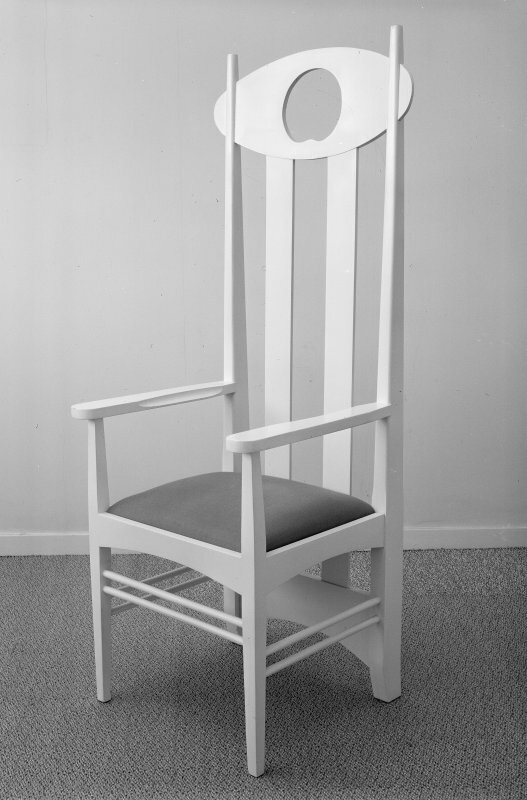 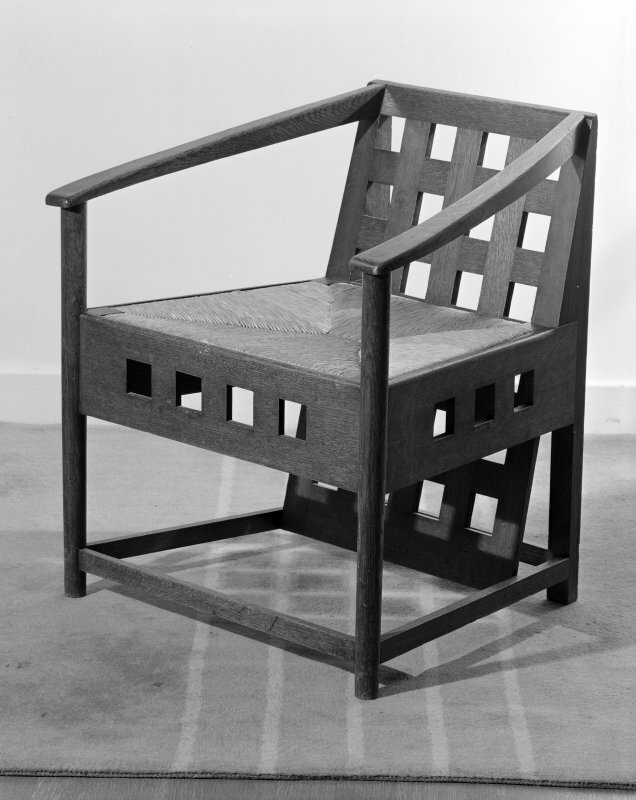 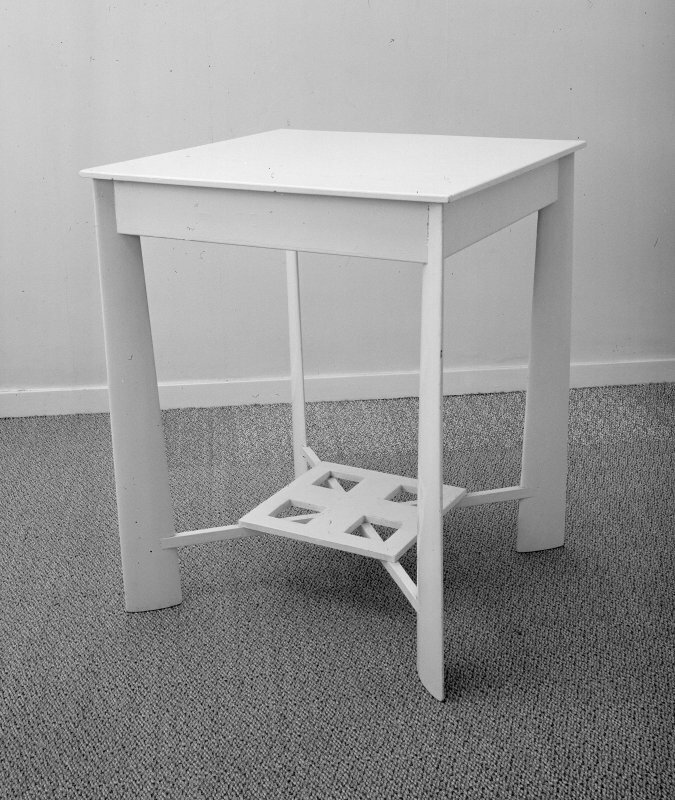 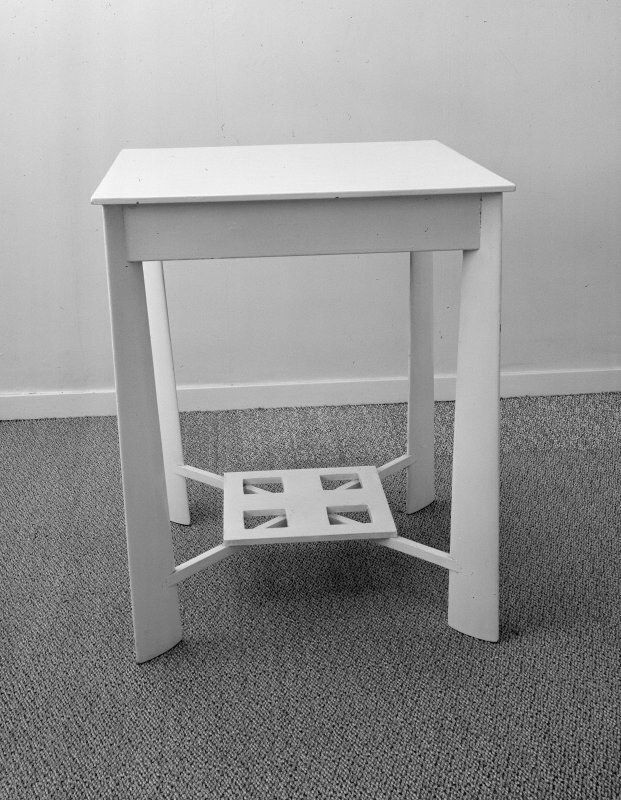 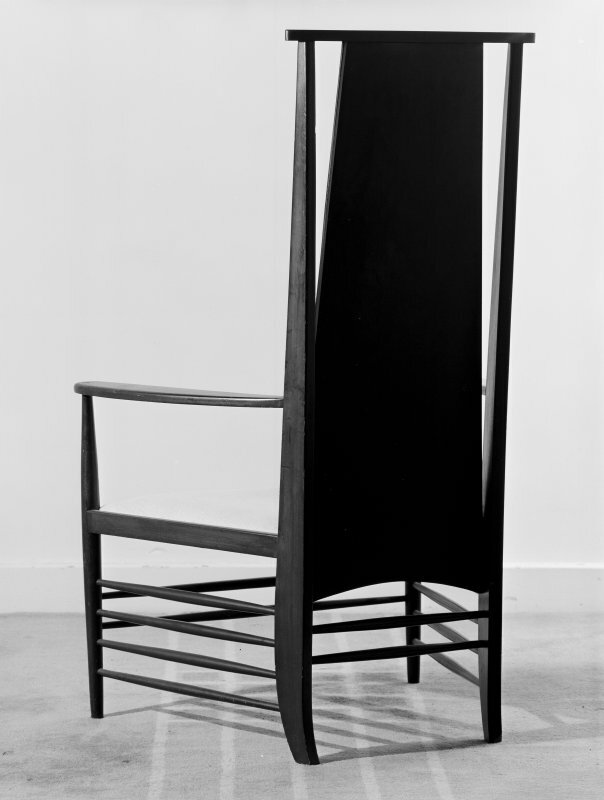 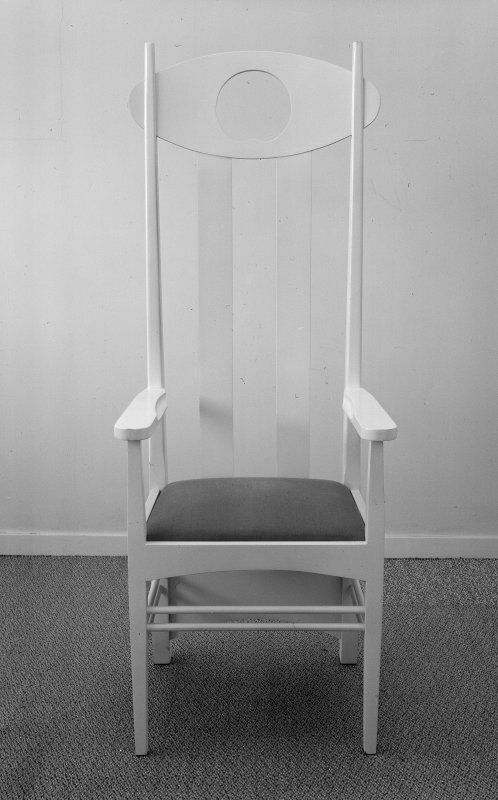 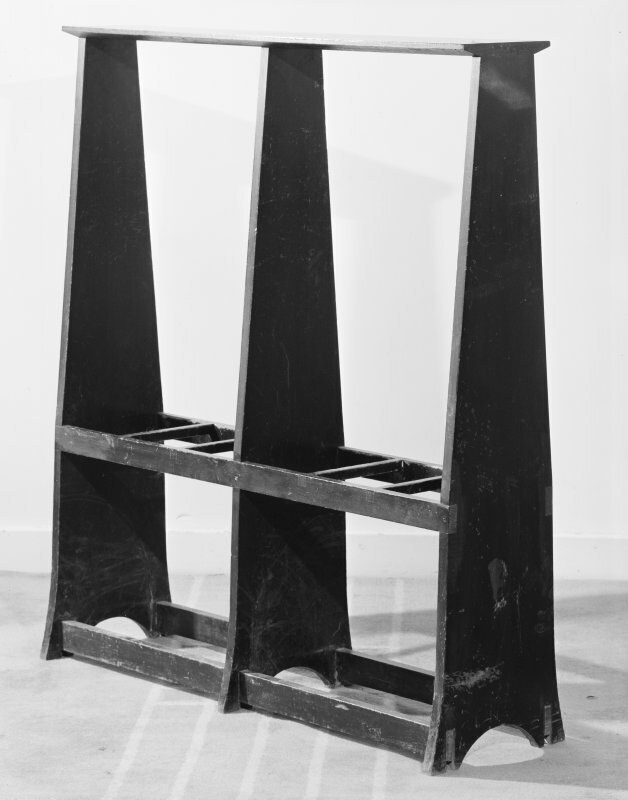 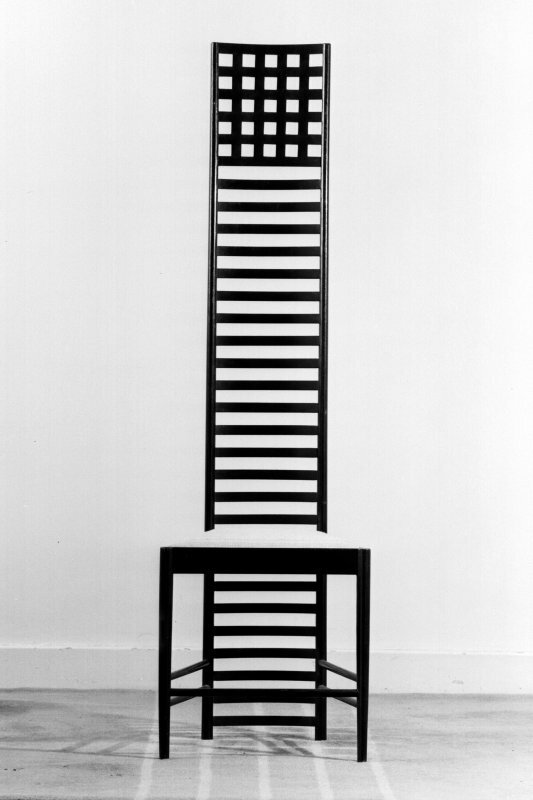 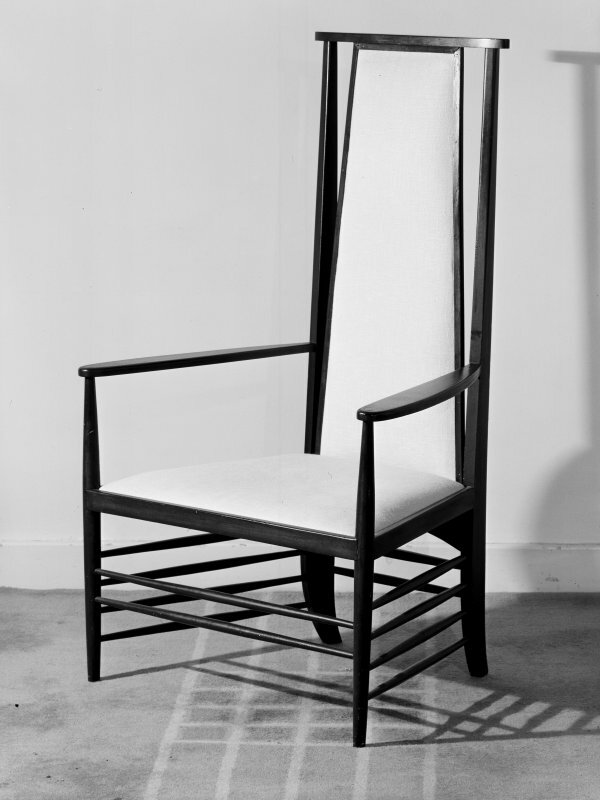 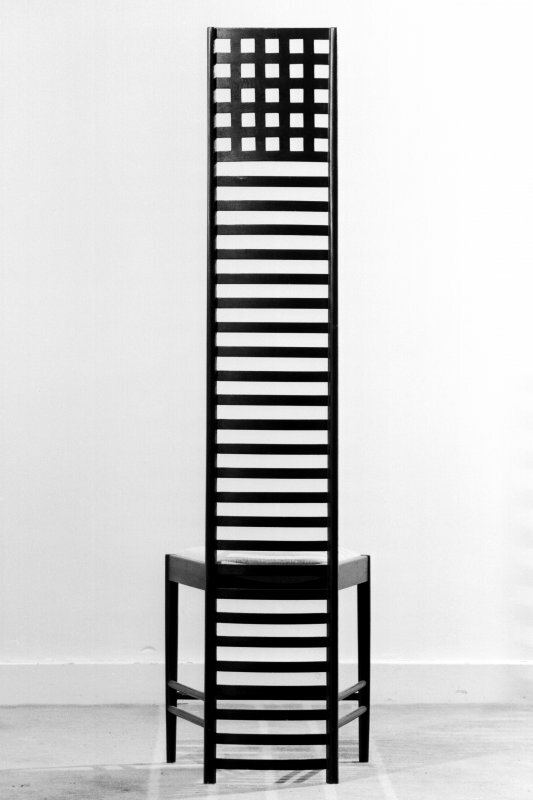 View of chair. 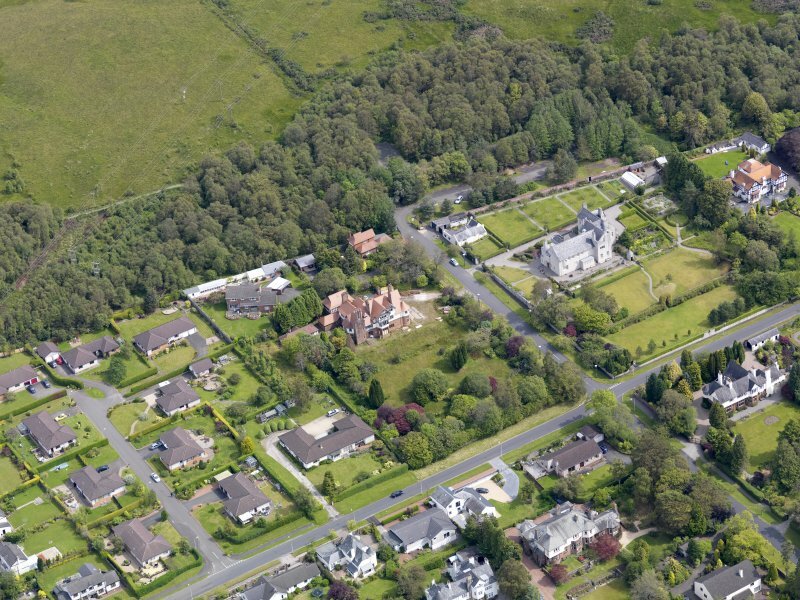 Oblique aerial view of Helensburgh, centred on the Hill House, taken from the NNW. 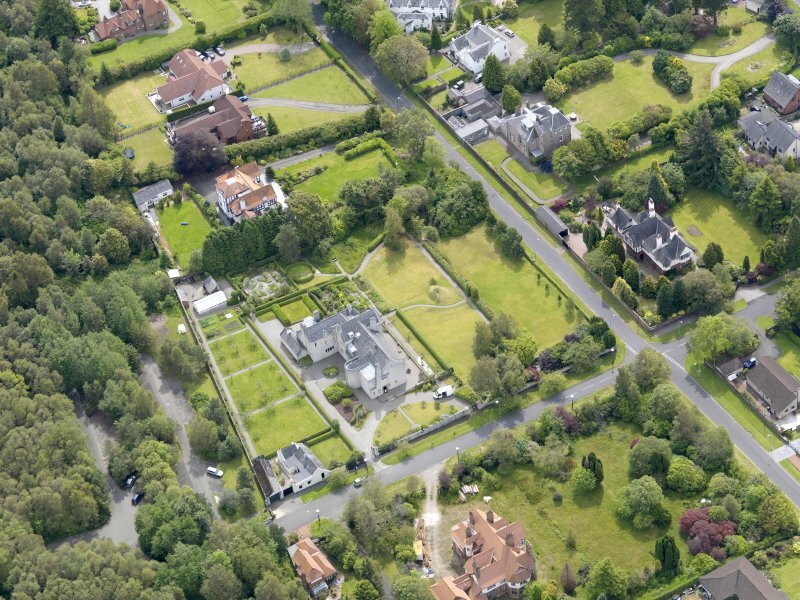 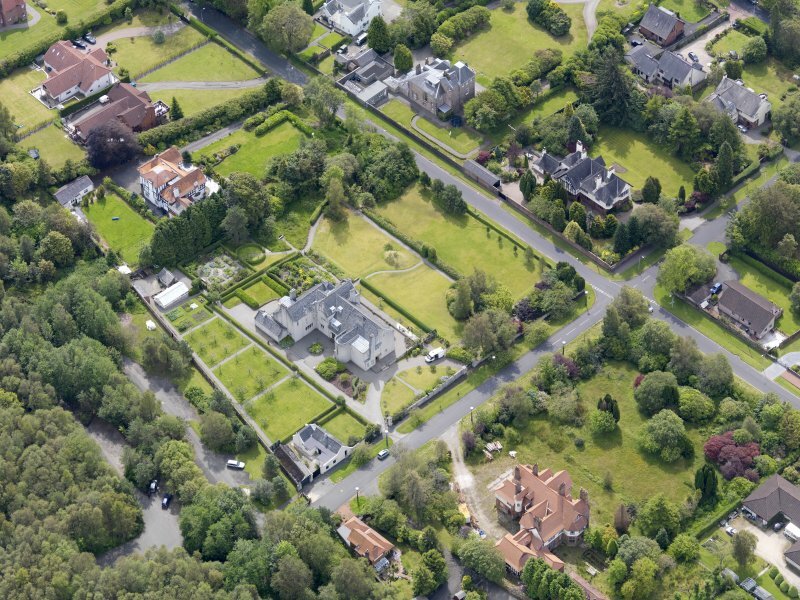 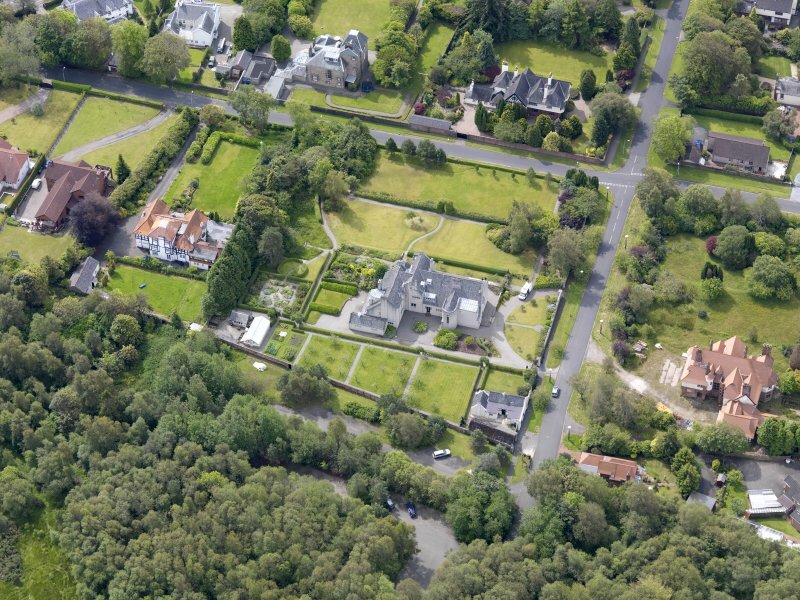 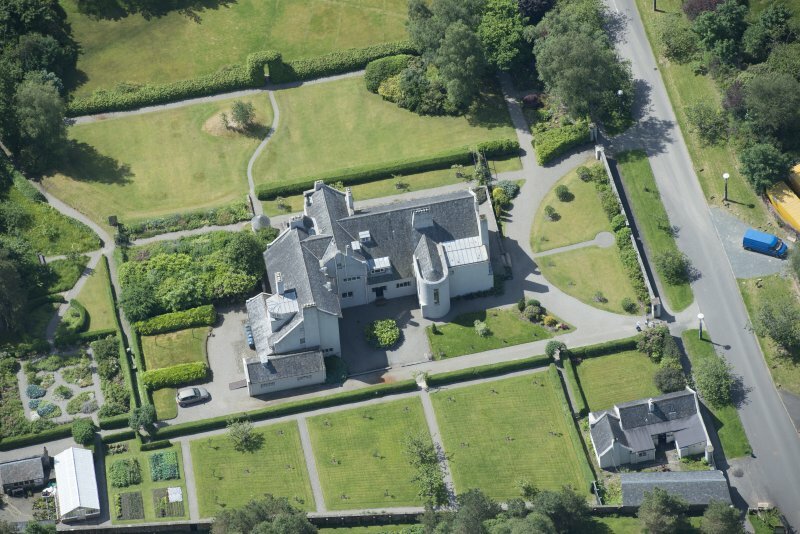 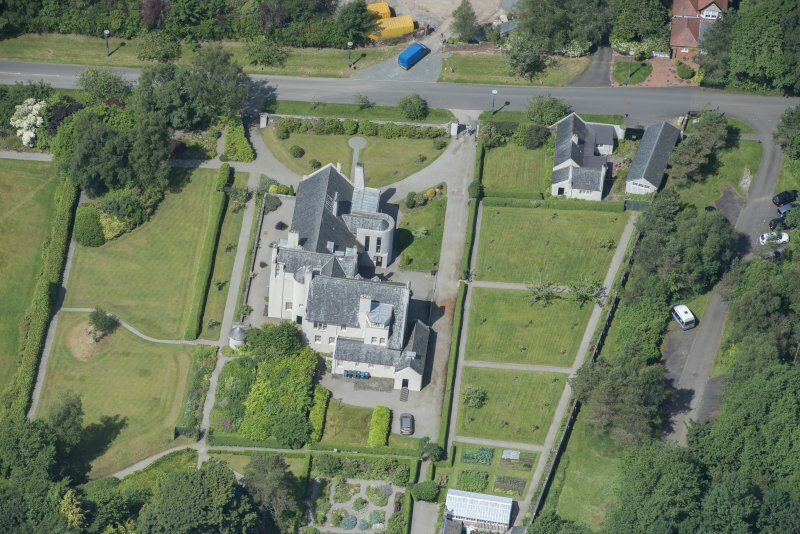 Oblique aerial view of Helensburgh, centred on the Hill House, taken from the SSW. 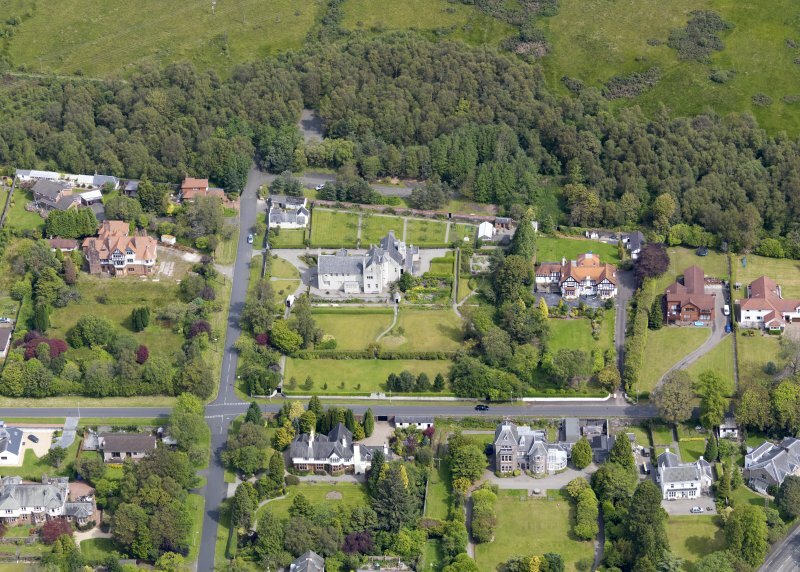 Oblique aerial view of Helensburgh, centred on the Hill House, taken from the SW.
Oblique aerial view of Helensburgh, centred on the Hill House, taken from the N.
The appropriately named Hill House stands above Helensburgh and commands extensive views to the south over the Firth of Clyde. 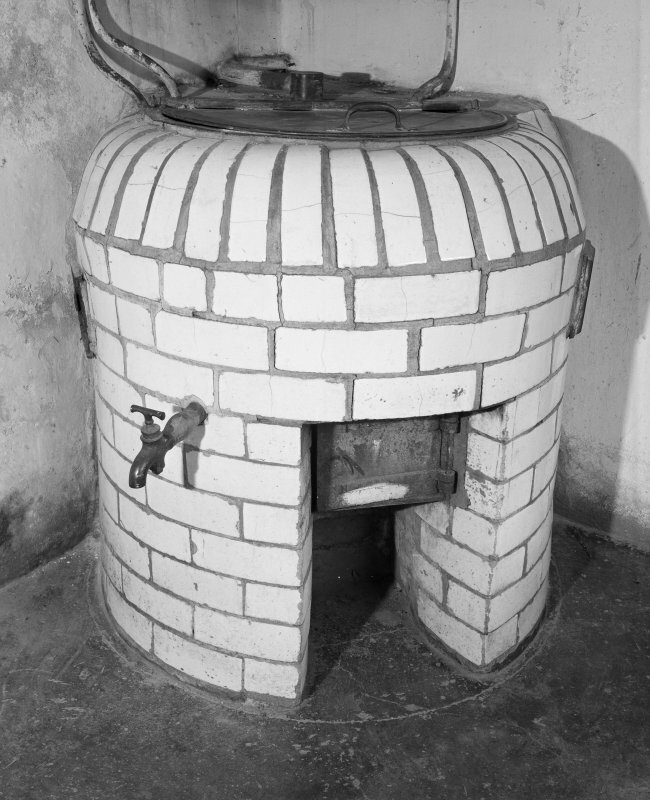 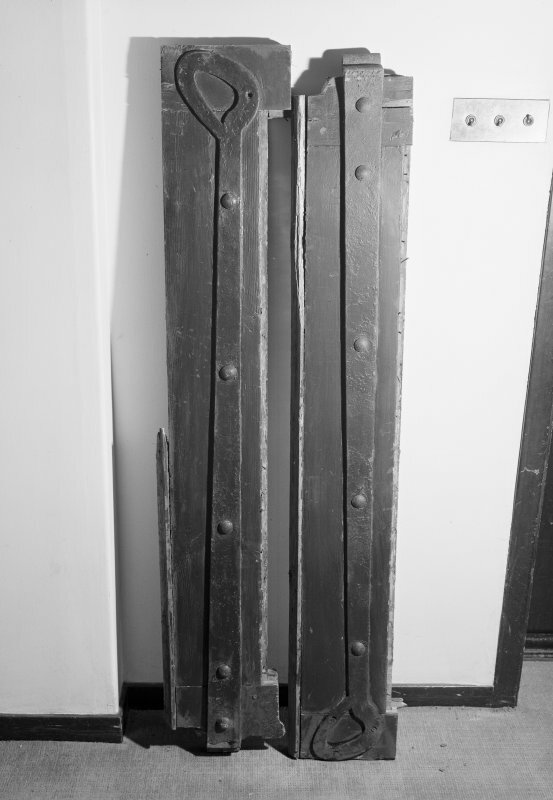 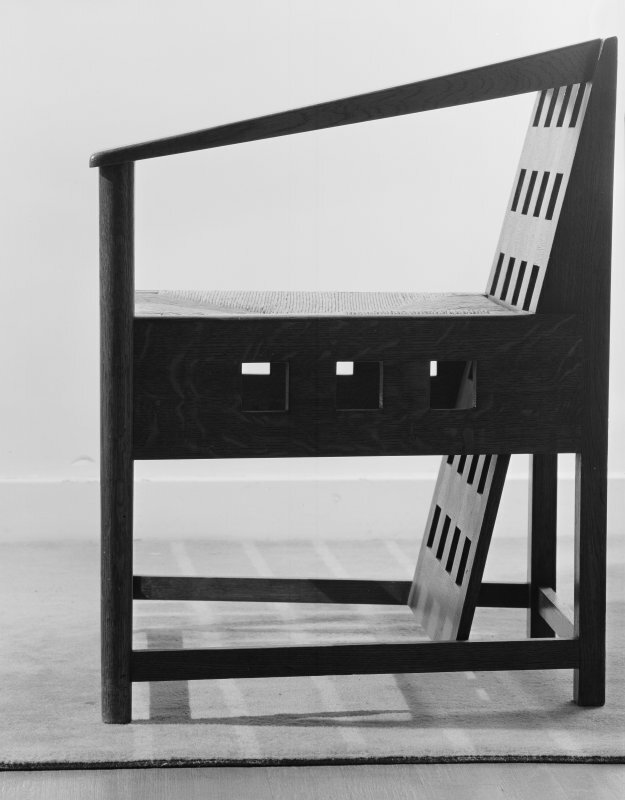 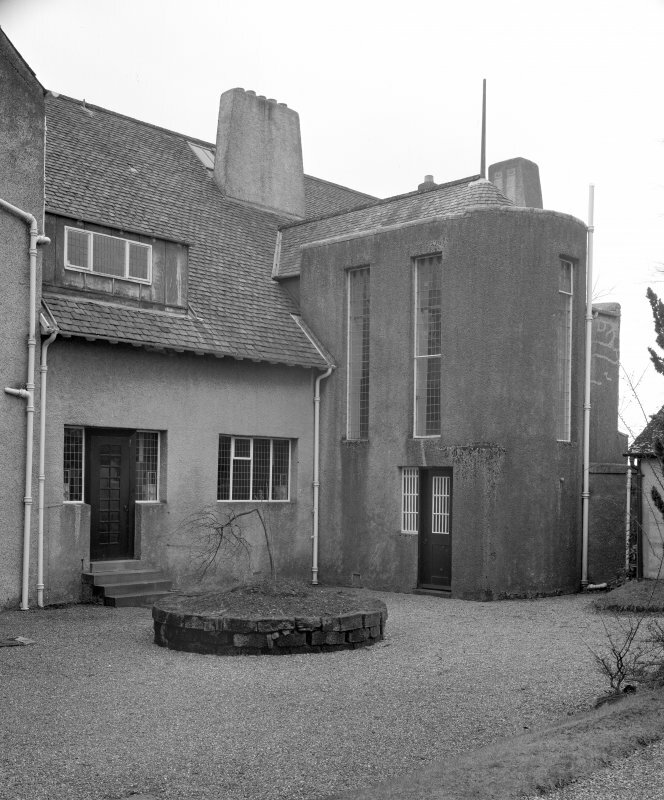 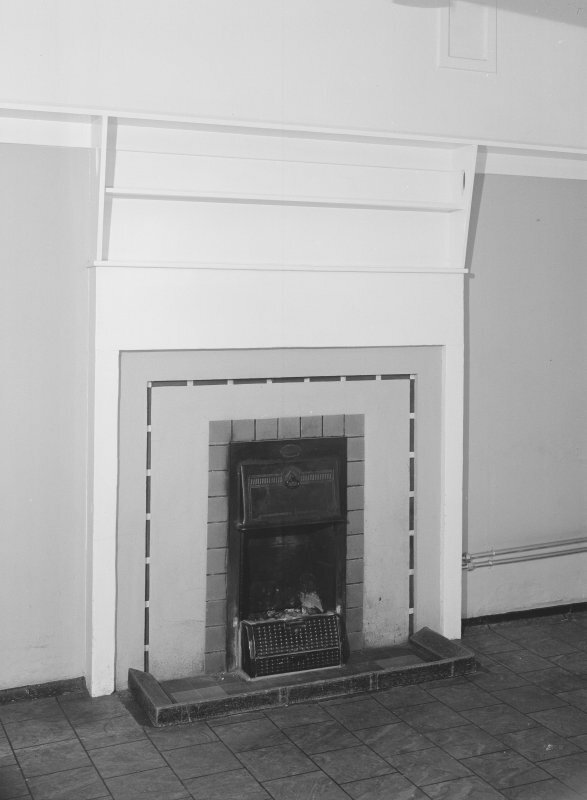 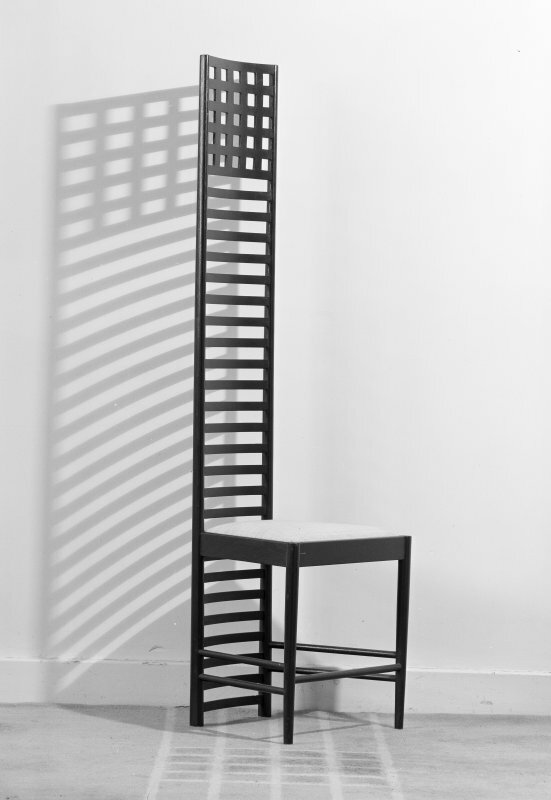 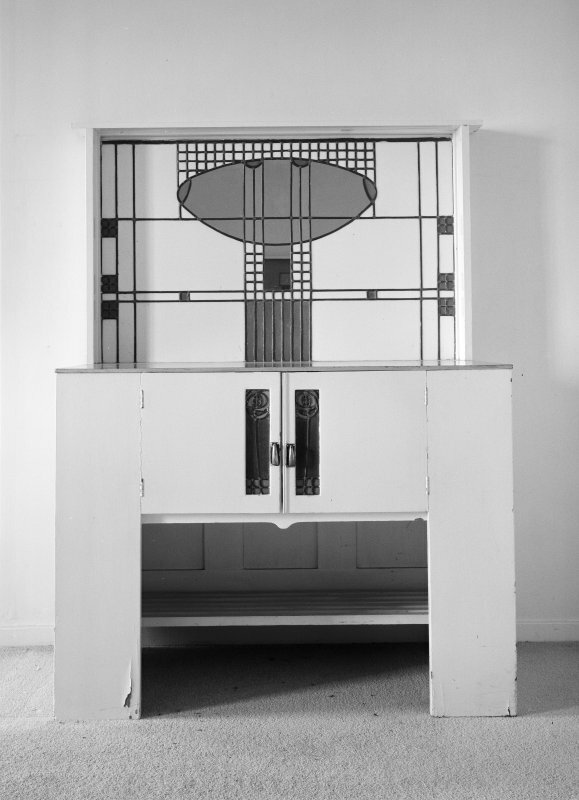 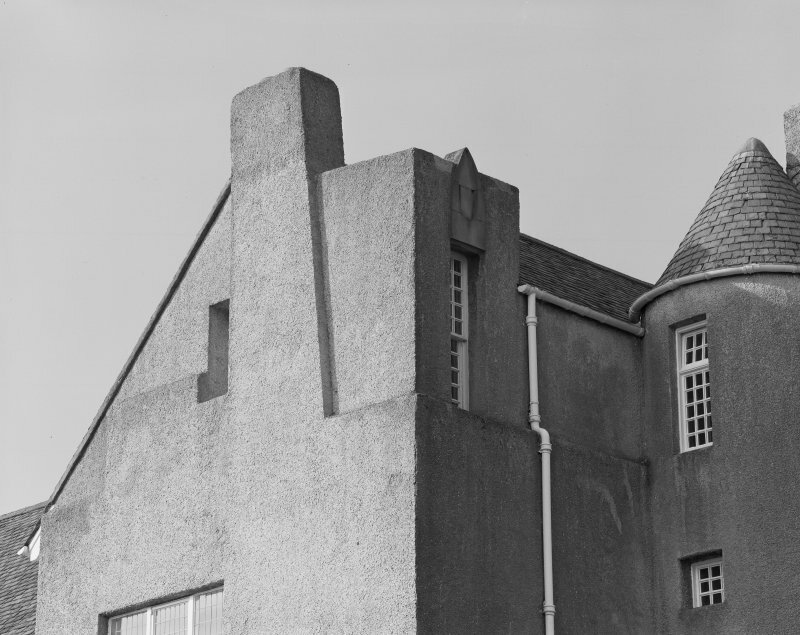 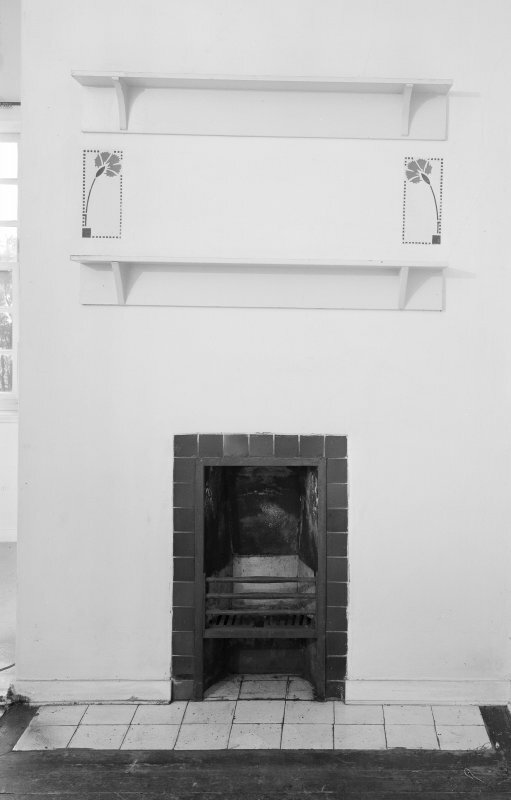 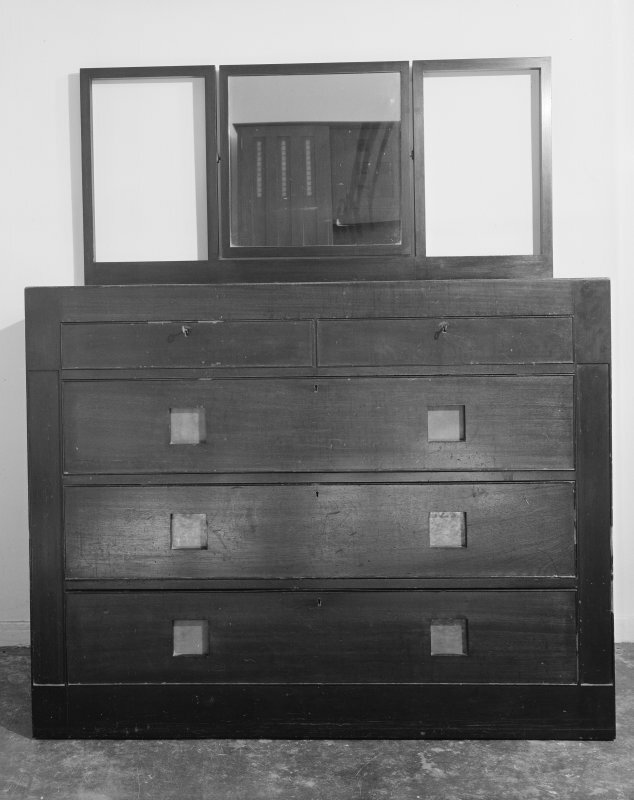 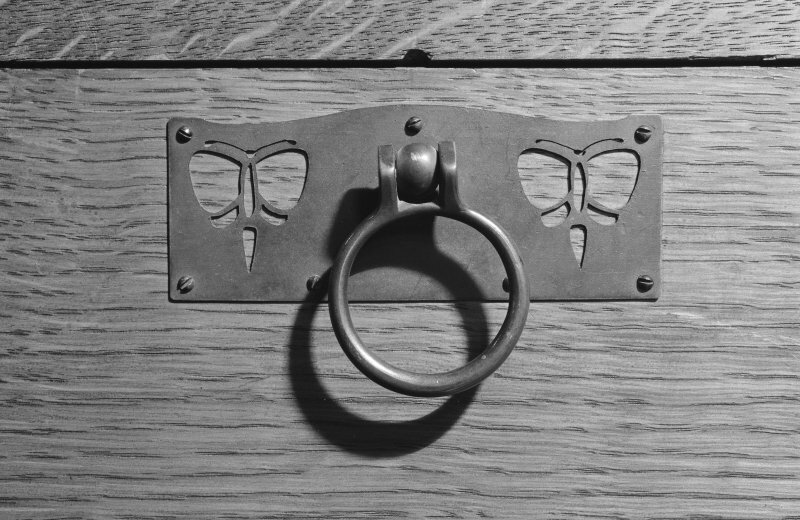 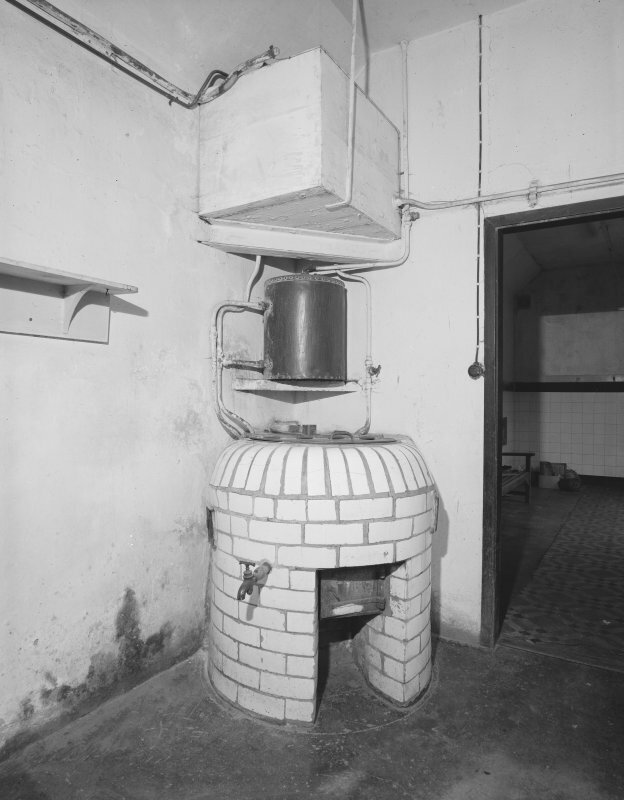 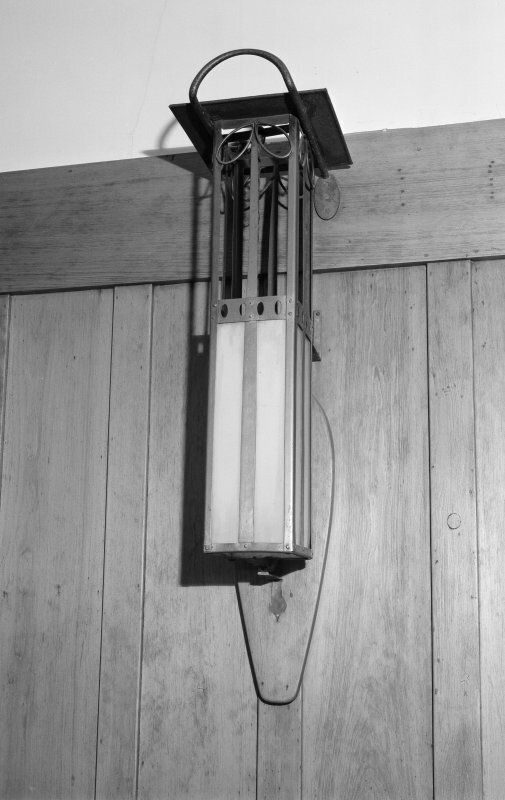 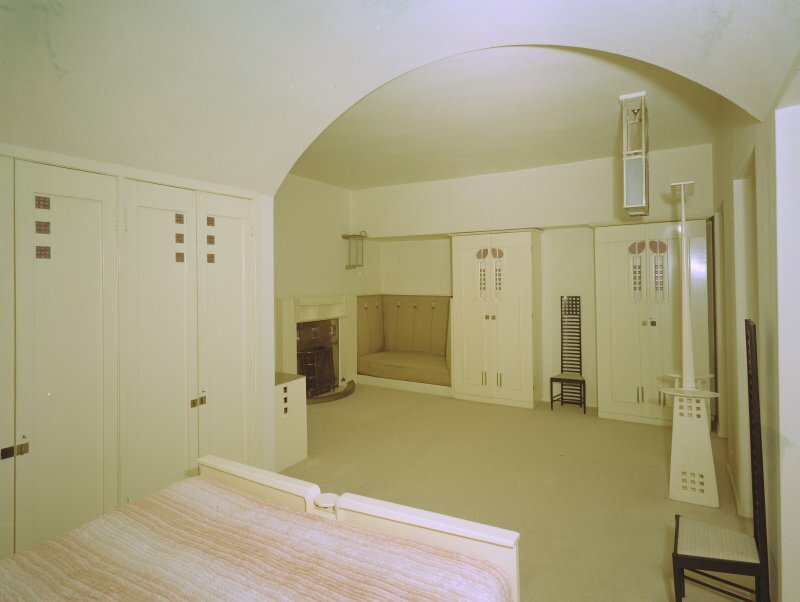 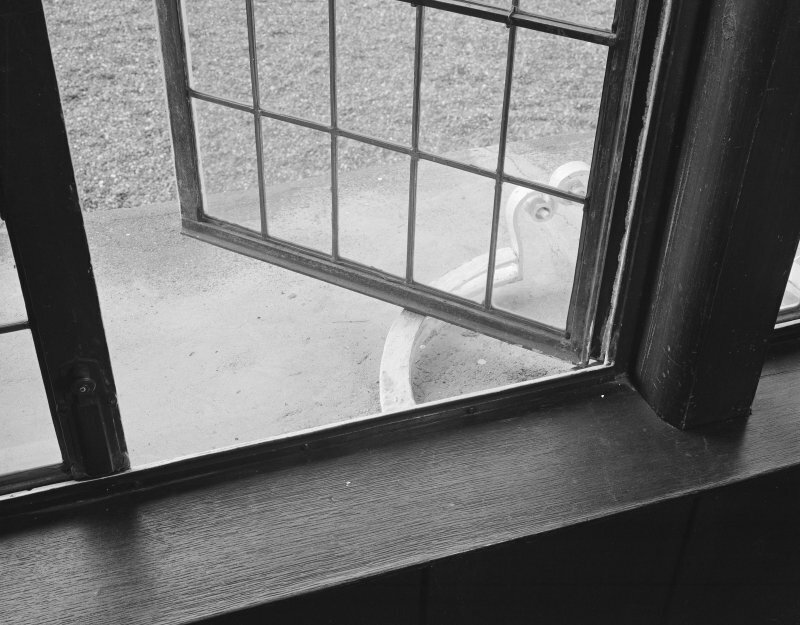 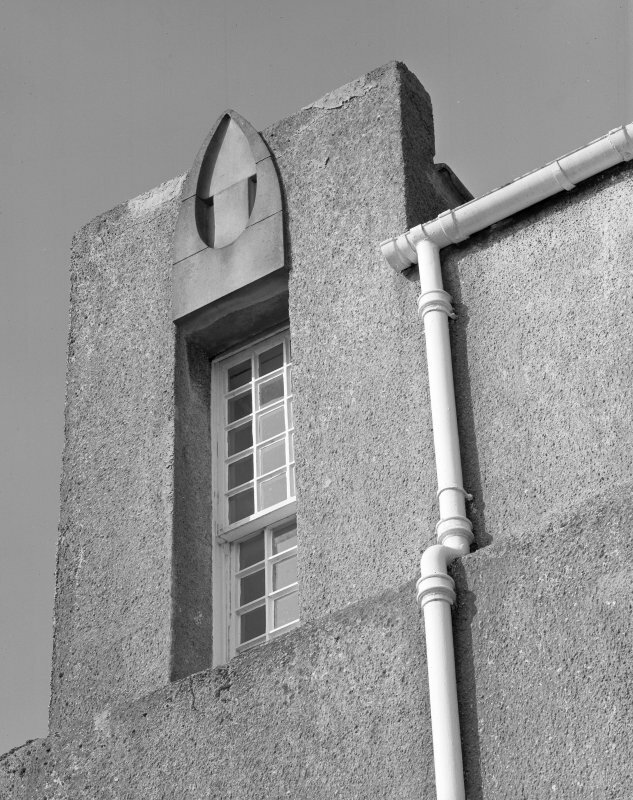 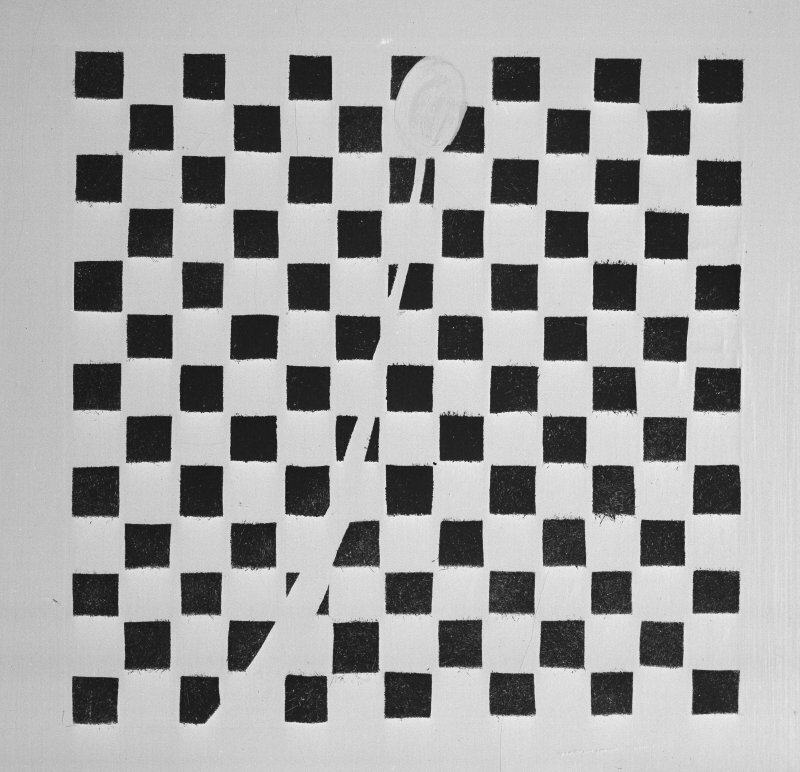 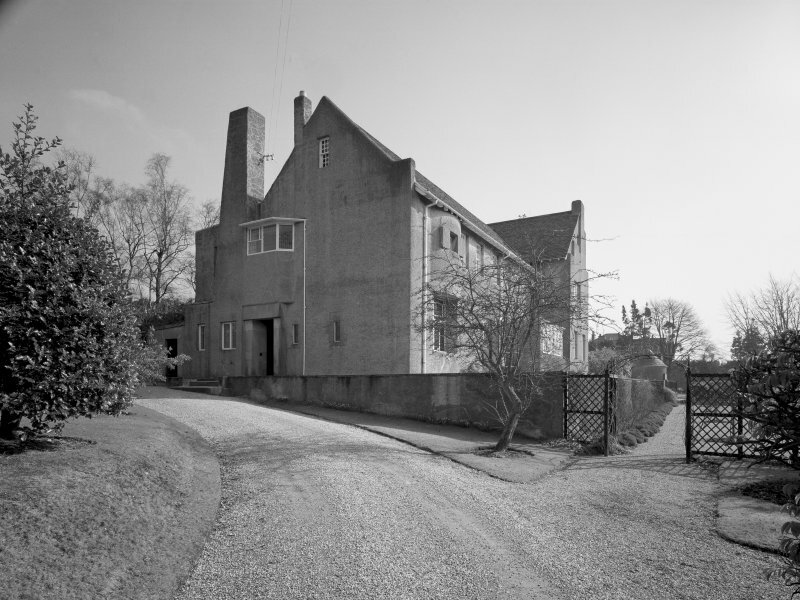 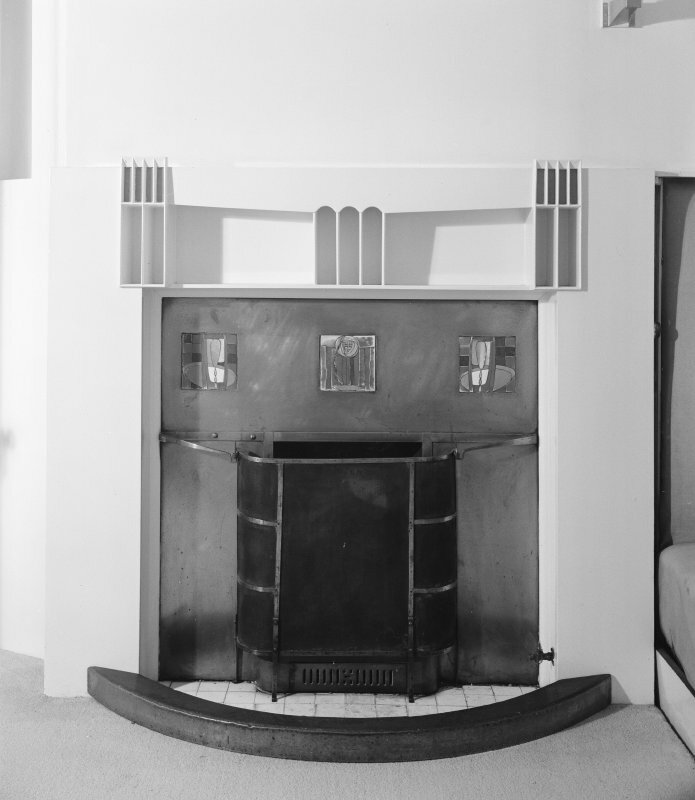 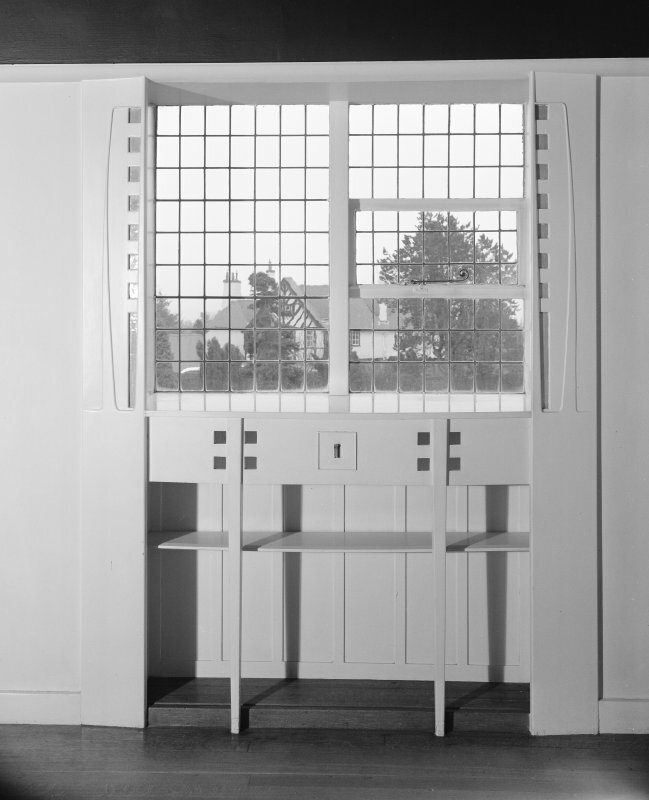 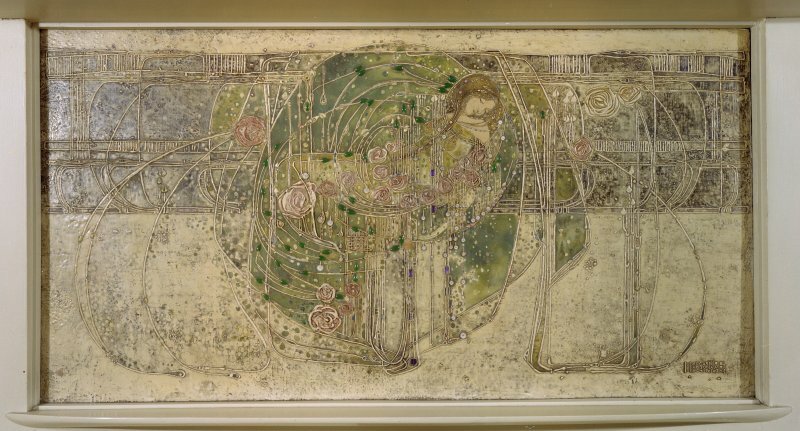 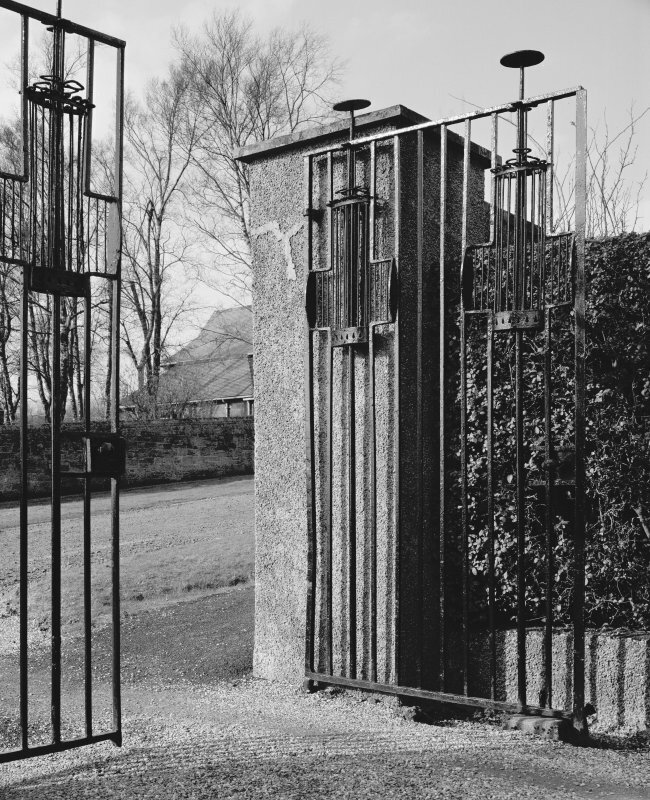 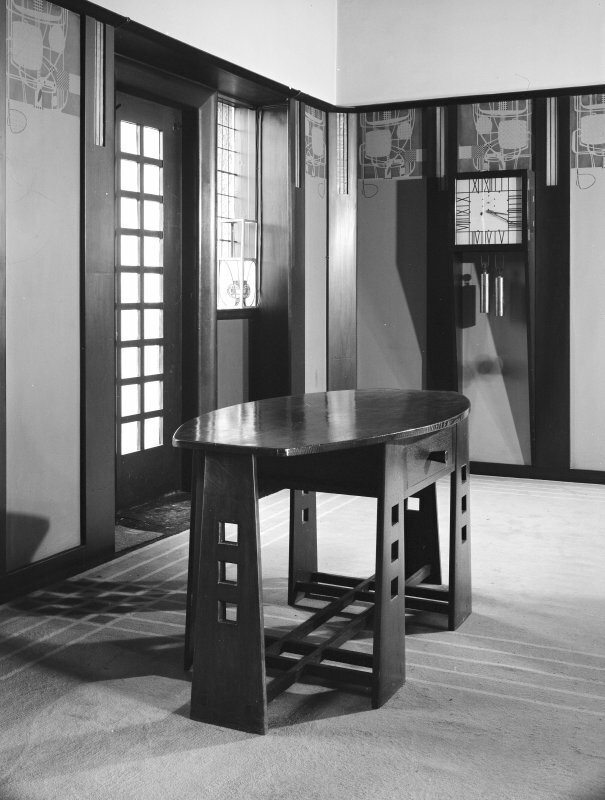 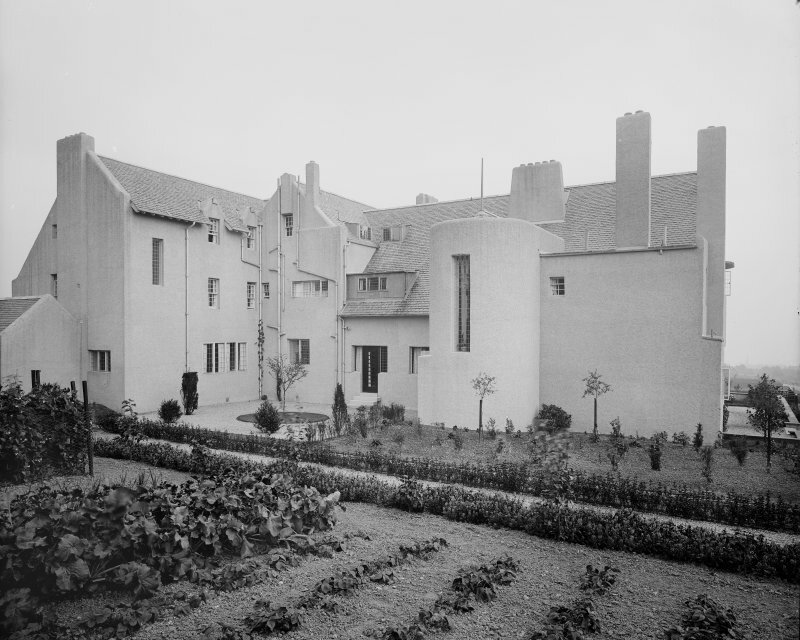 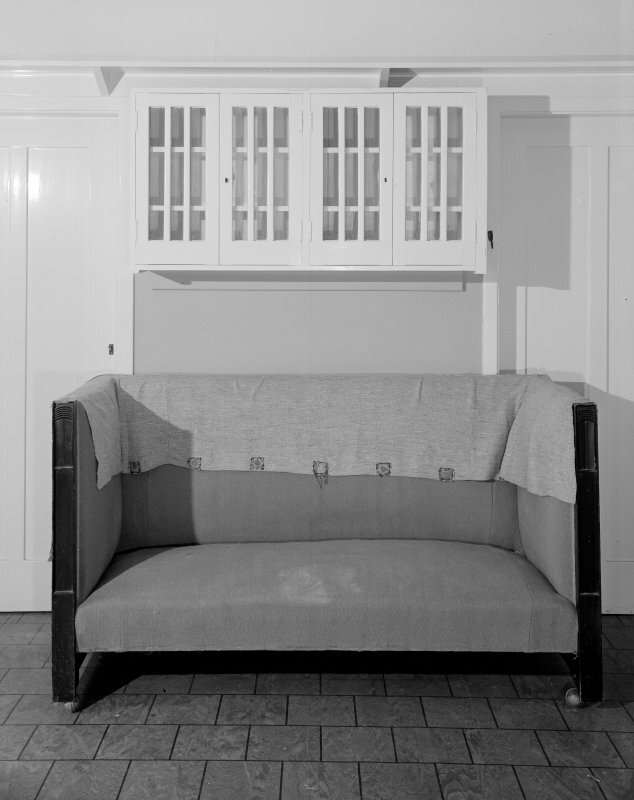 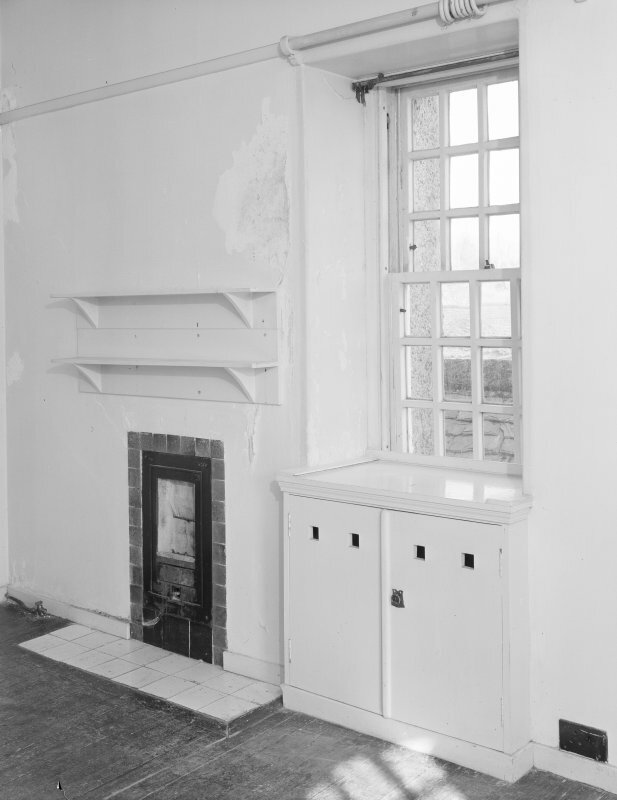 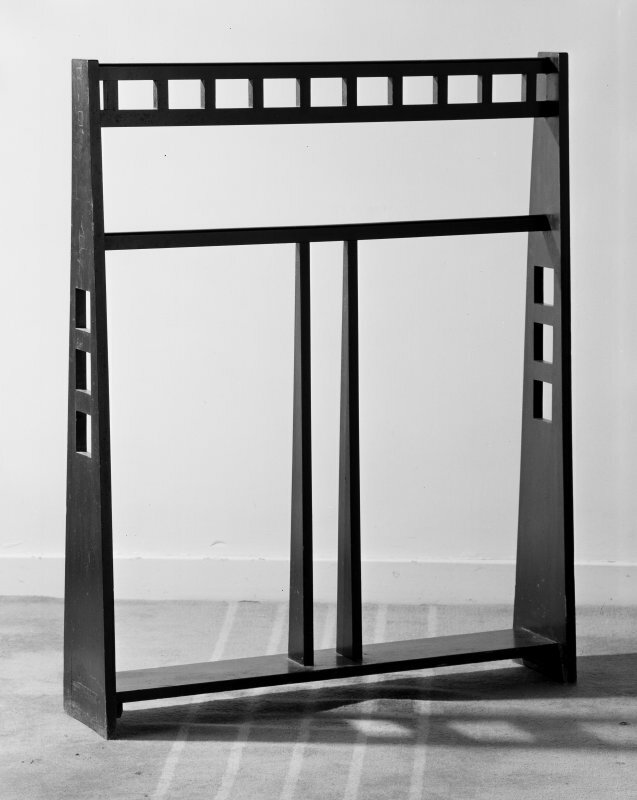 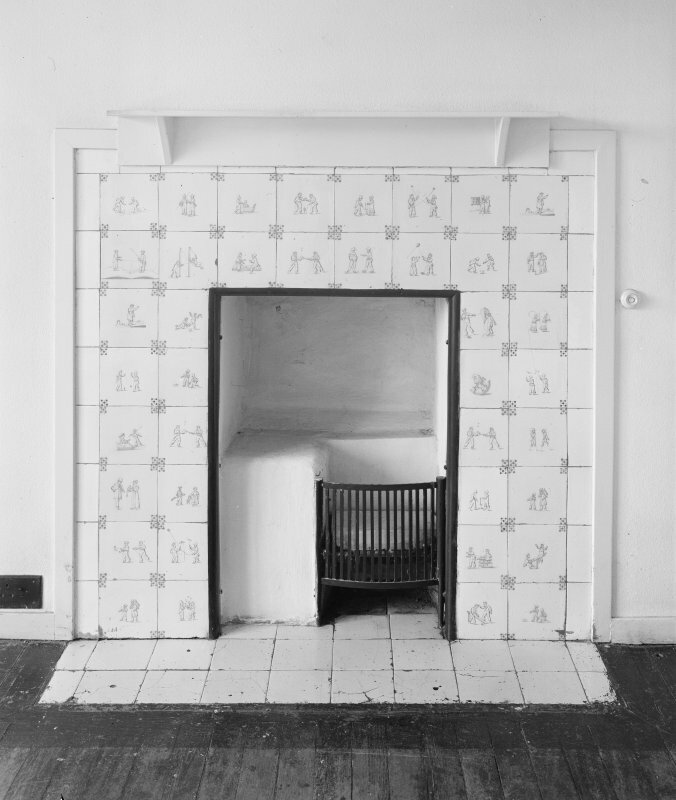 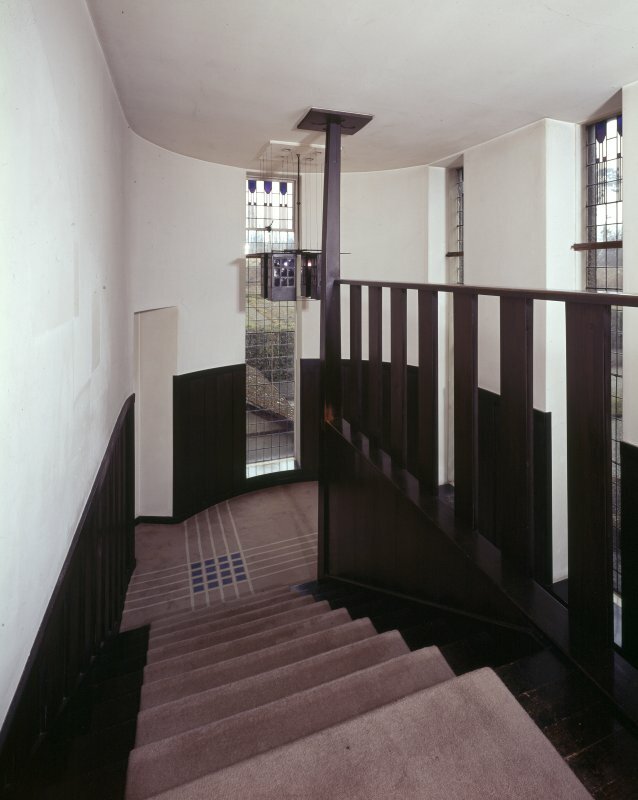 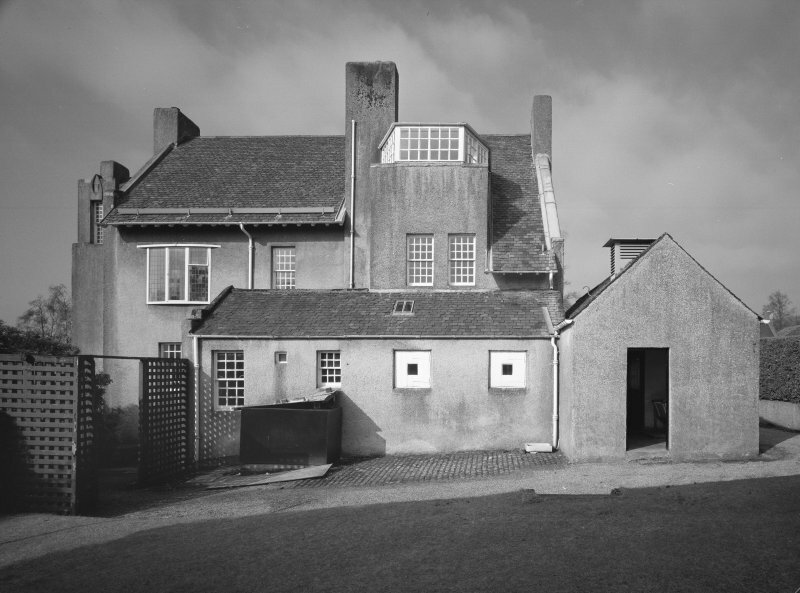 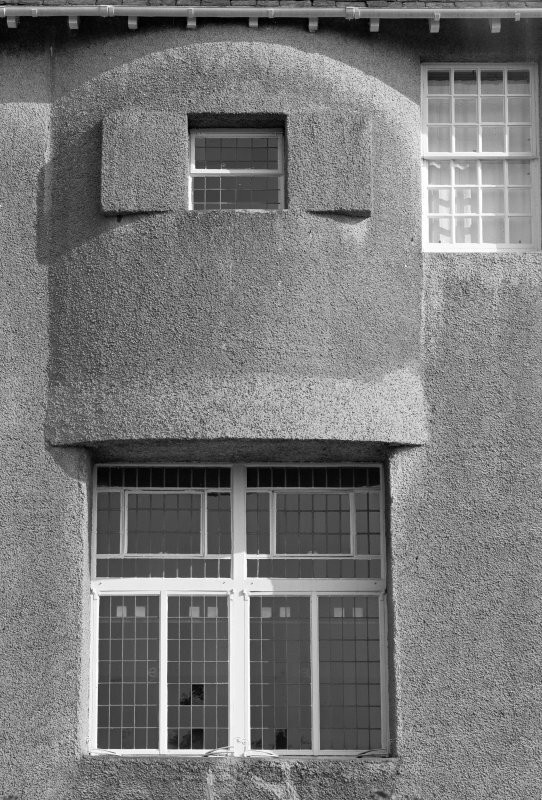 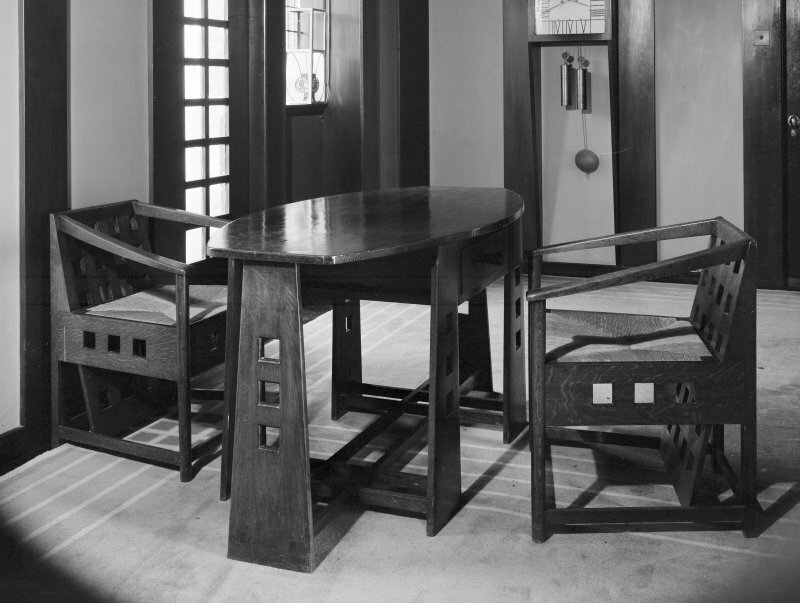 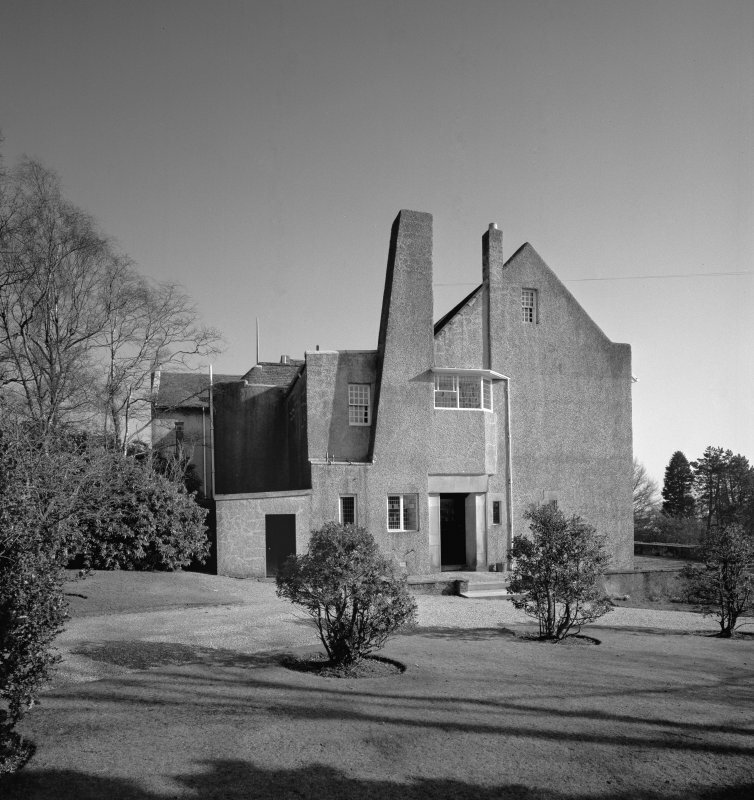 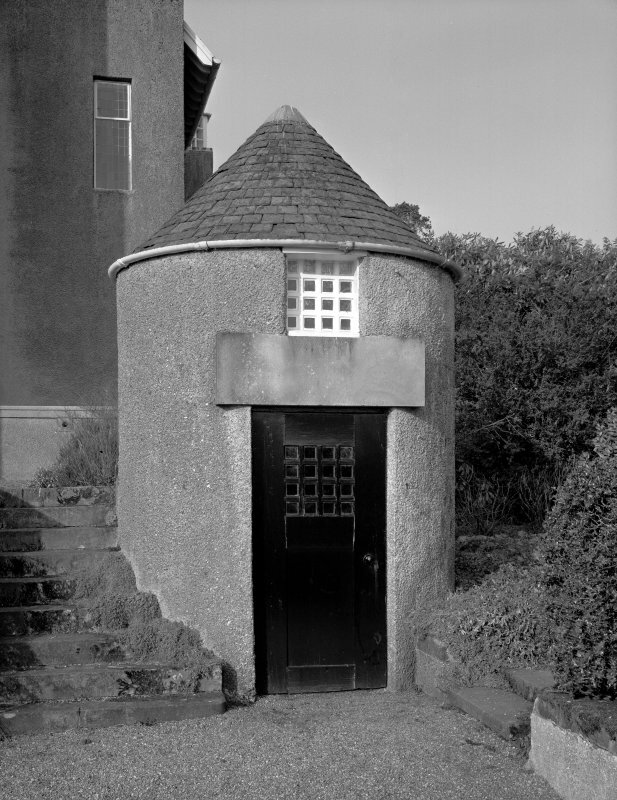 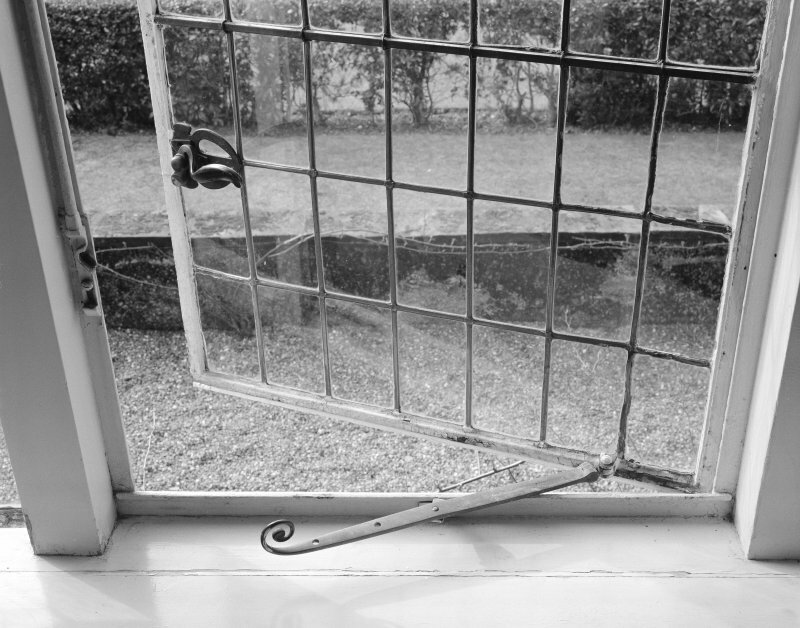 It was Charles Rennie Mackintosh's major domestic commission, and the house along with most of its original furniture and fittings are now in the care of the National Trust forScotland. 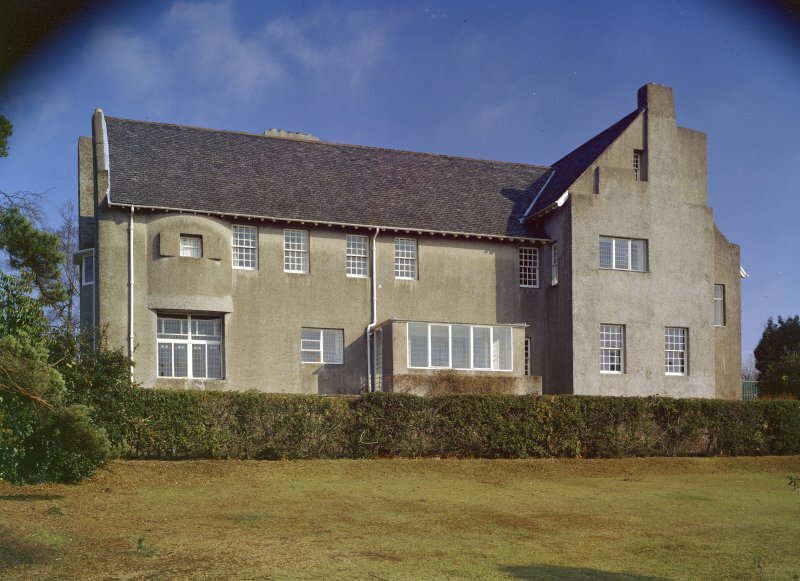 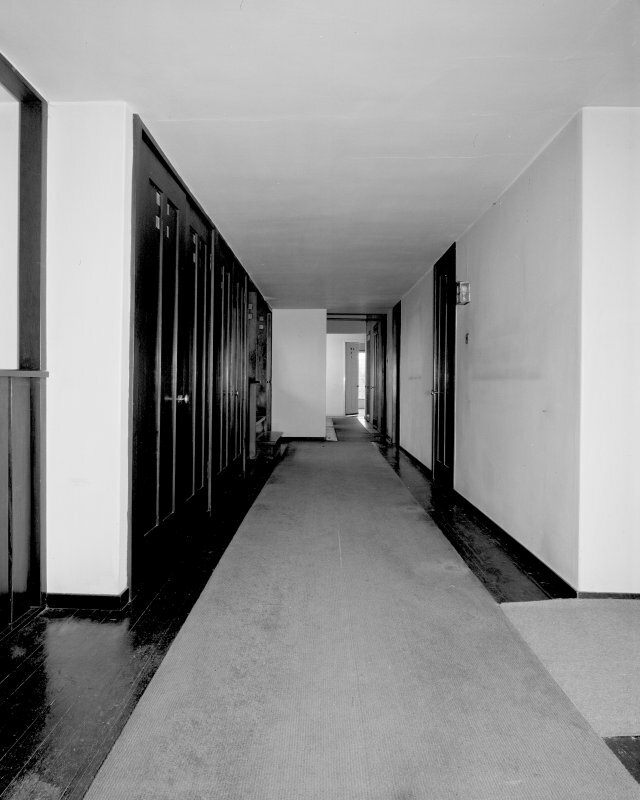 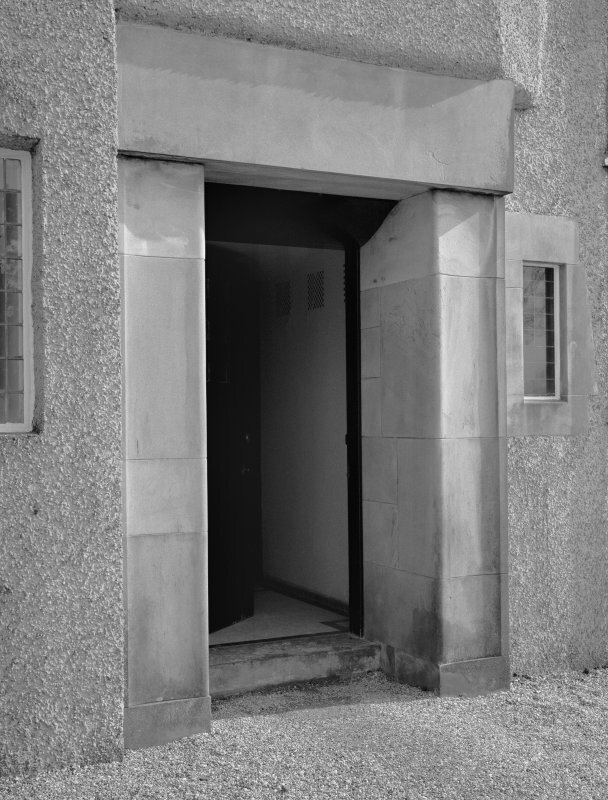 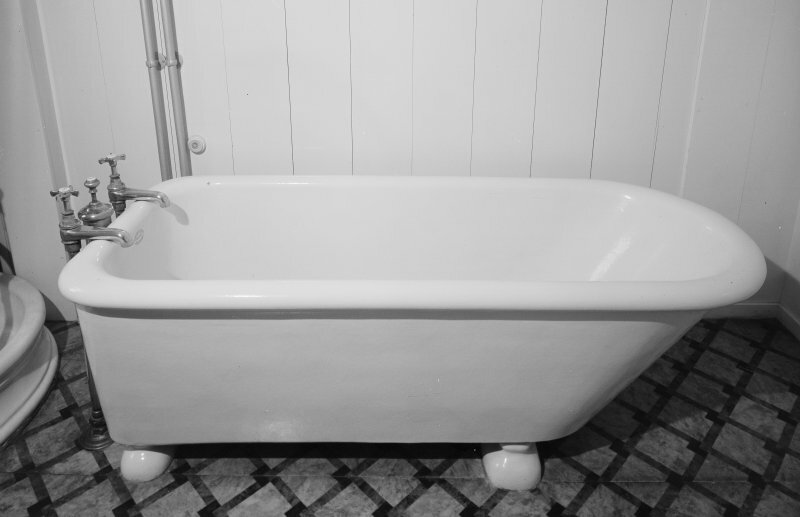 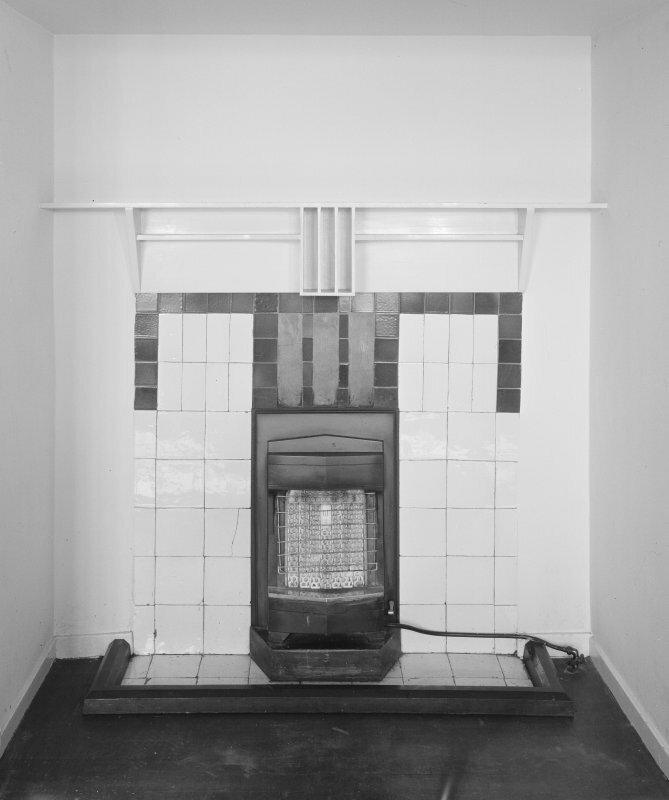 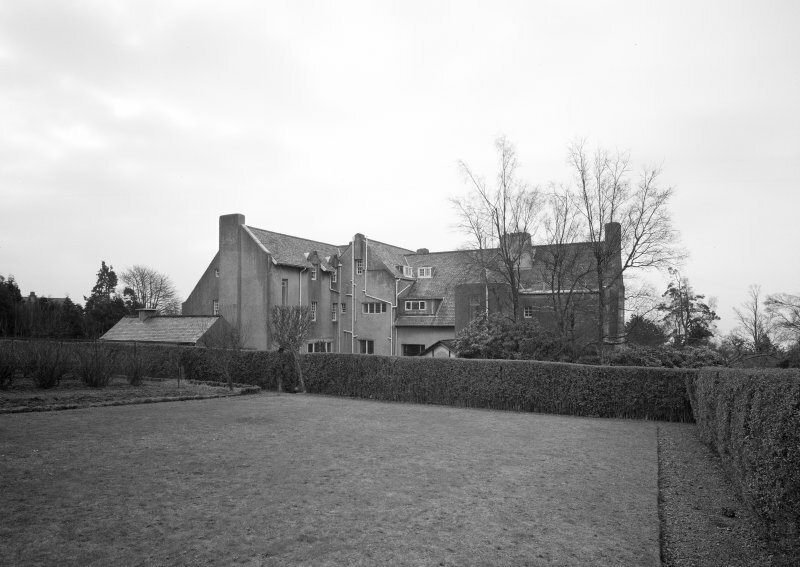 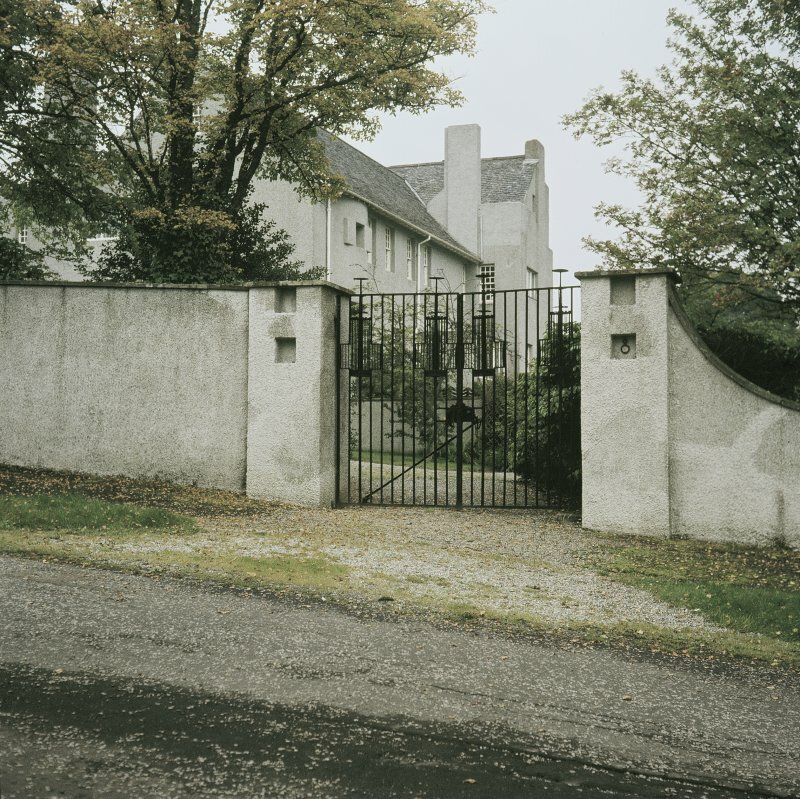 The house was built between 1902-4 for W W Blackie, the Glasgow publisher, and it was designed as a family home, but one in which WaIter Blackie could also have privacy to entertain clients without disrupting the rest of the household. 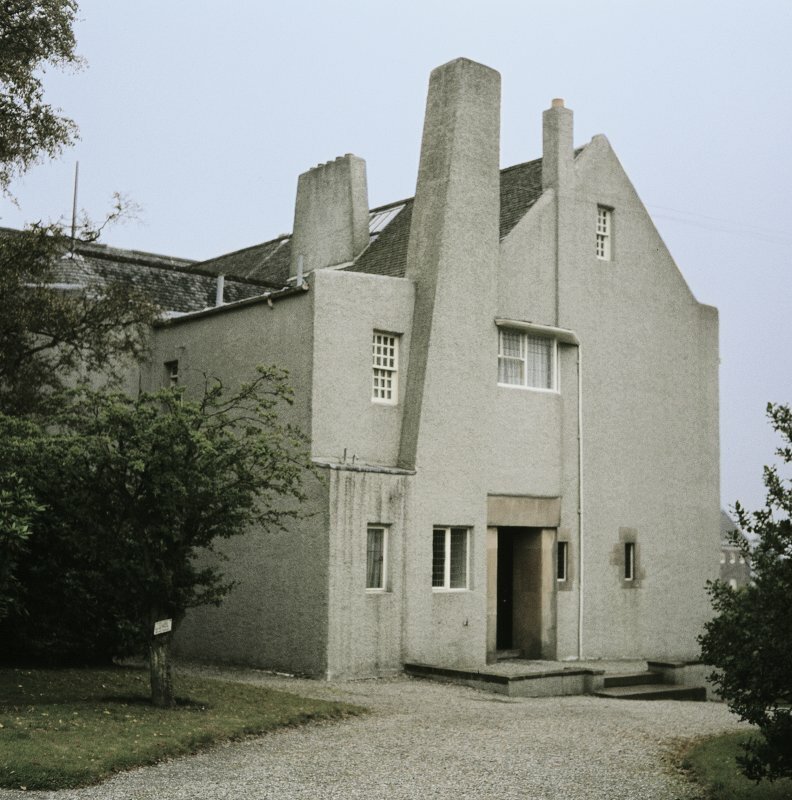 From the exterior the house seems austere, even severe, with its plain harling and lack of ornament, but its interest is derived from the combination of traditional Scottish features with details that are clearly modem. 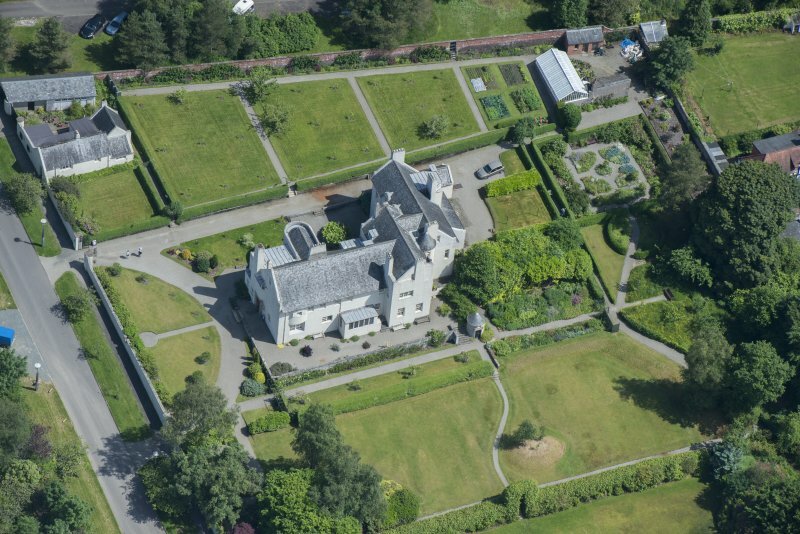 Like Brodick Castle (no. 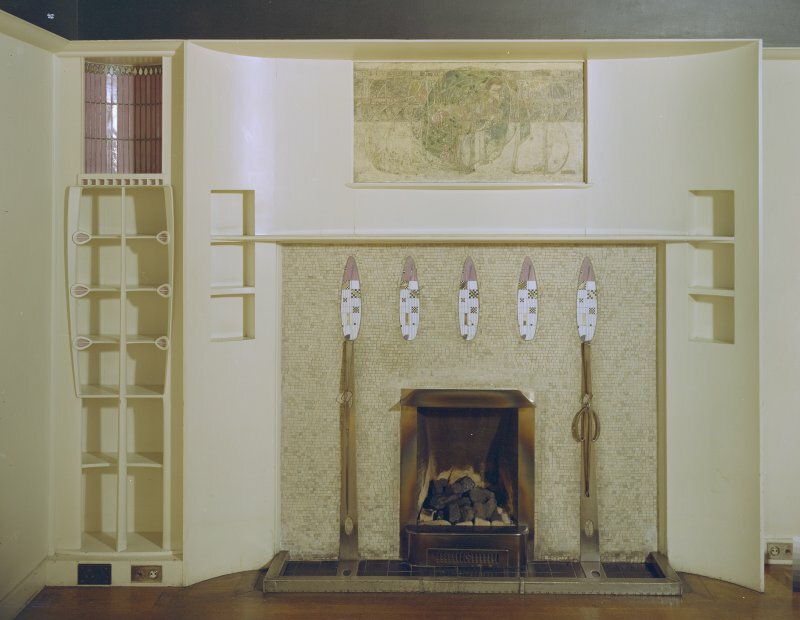 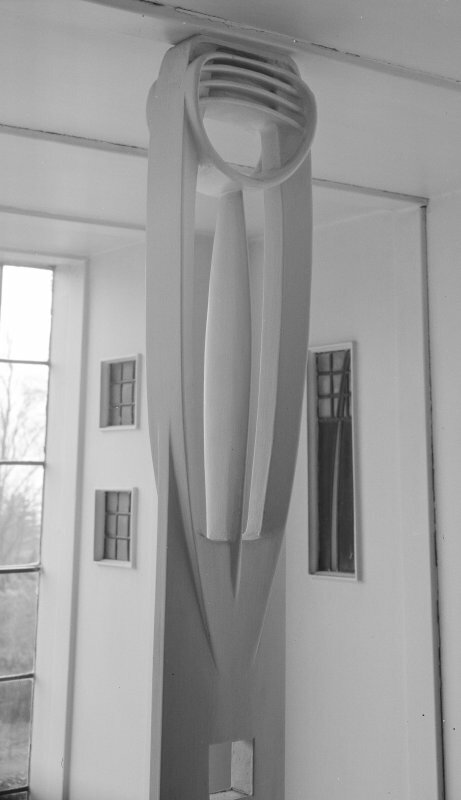 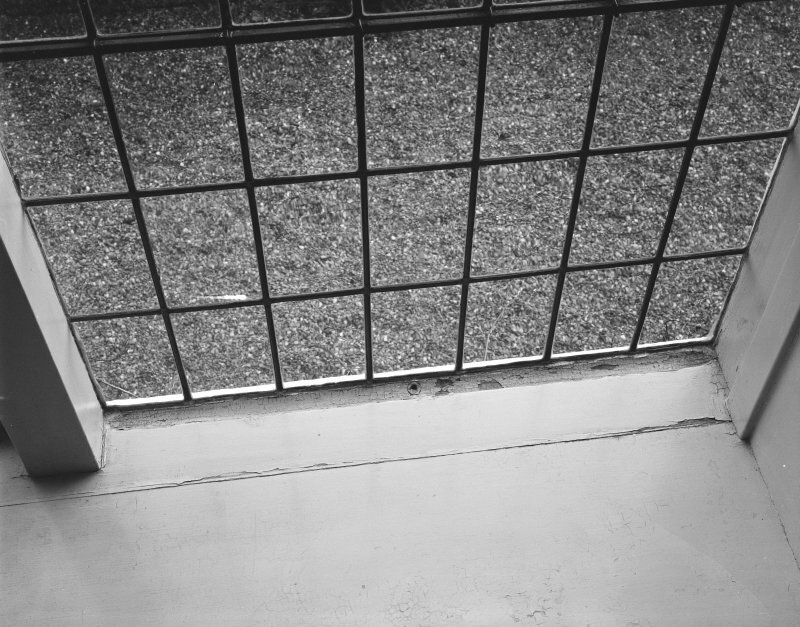 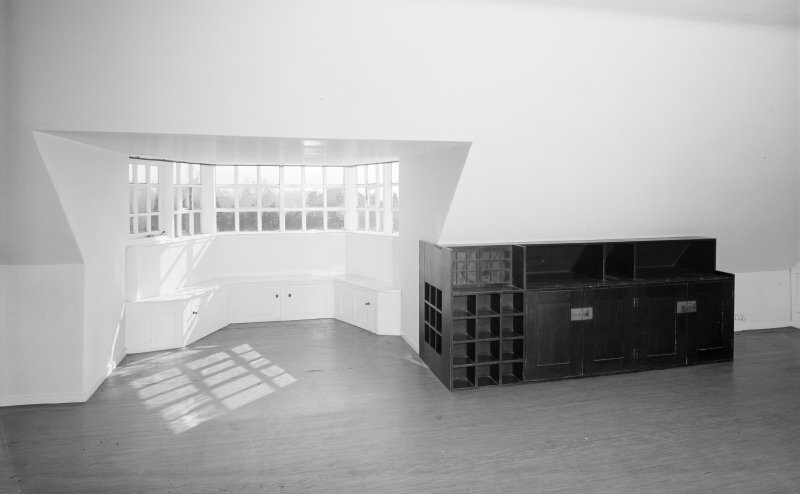 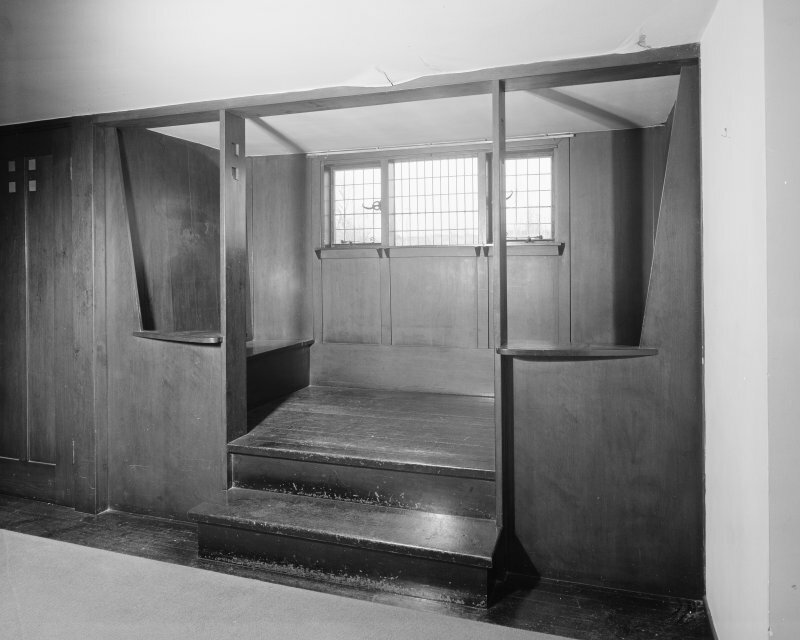 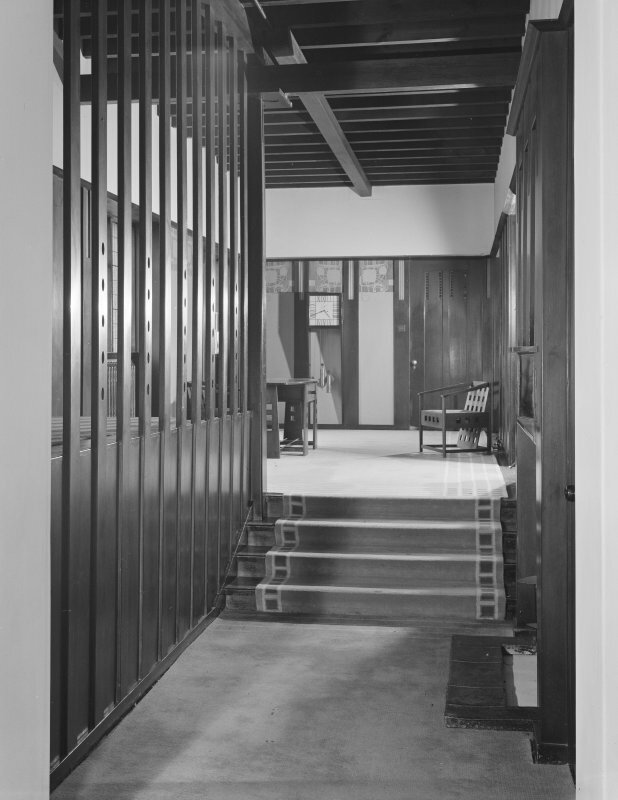 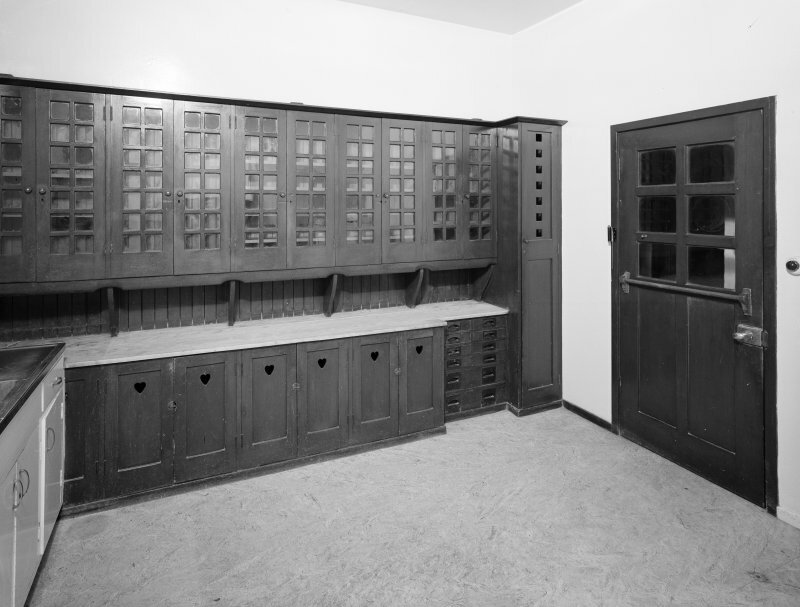 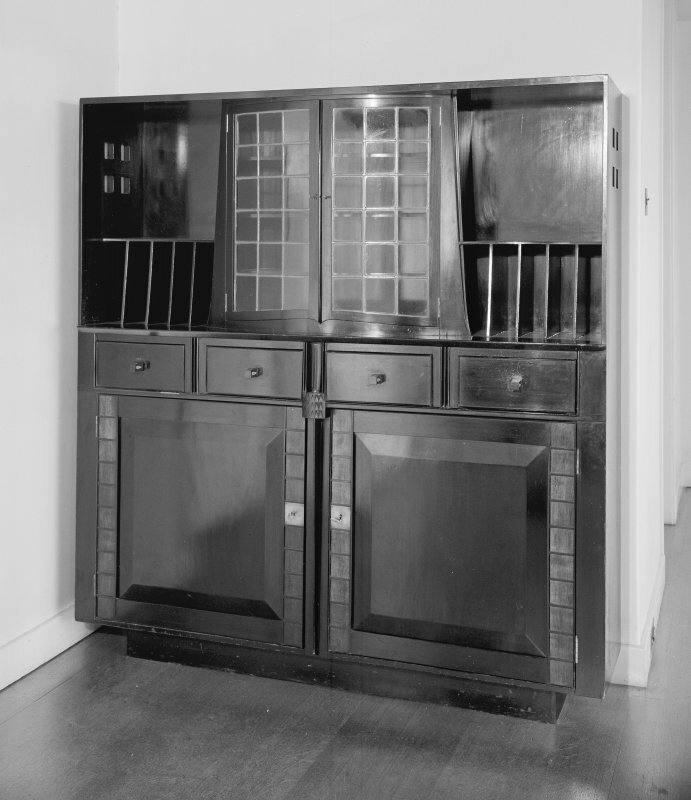 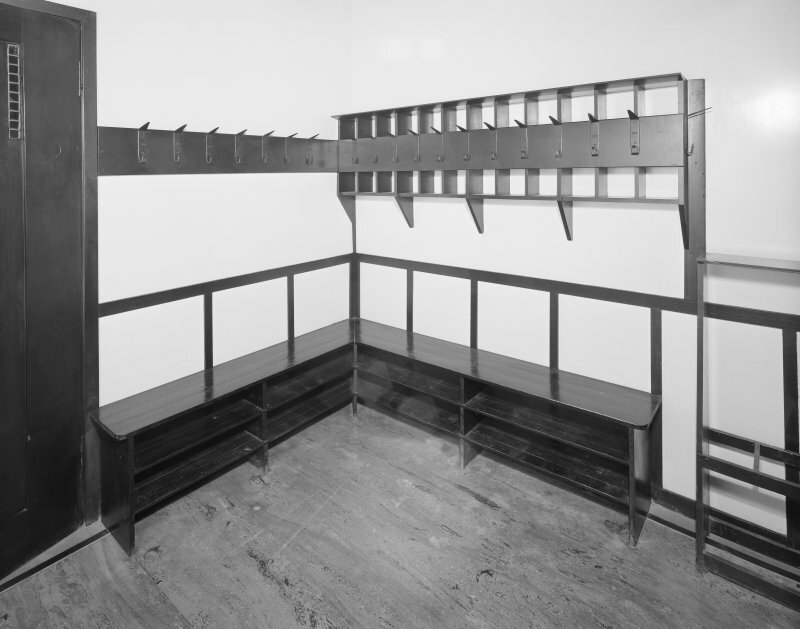 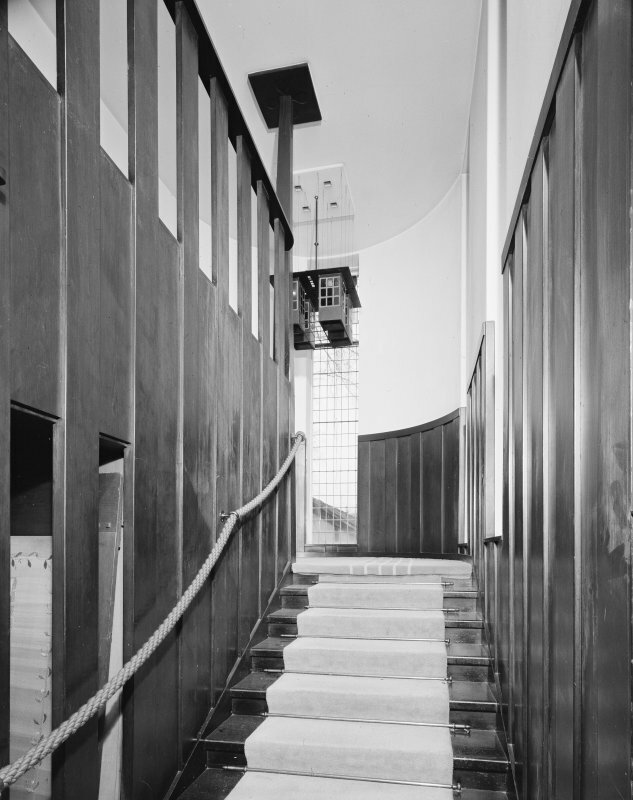 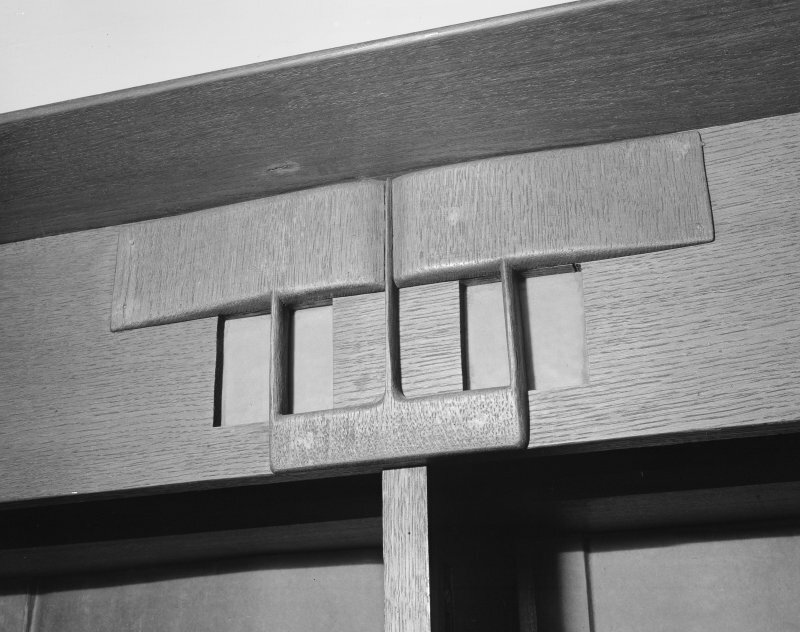 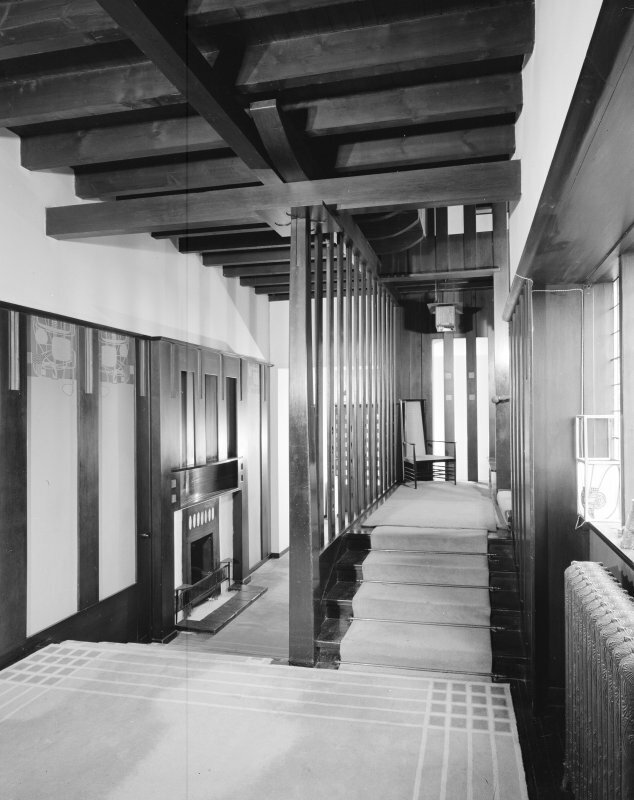 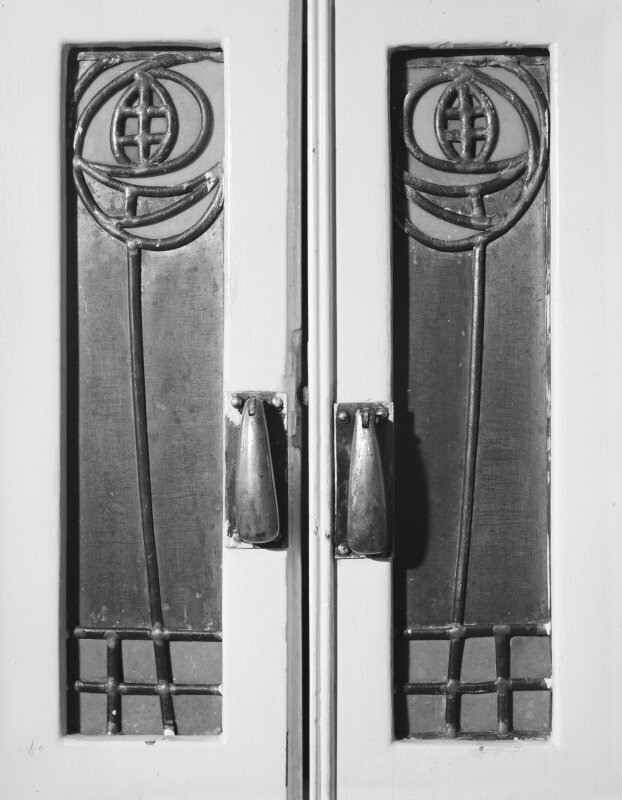 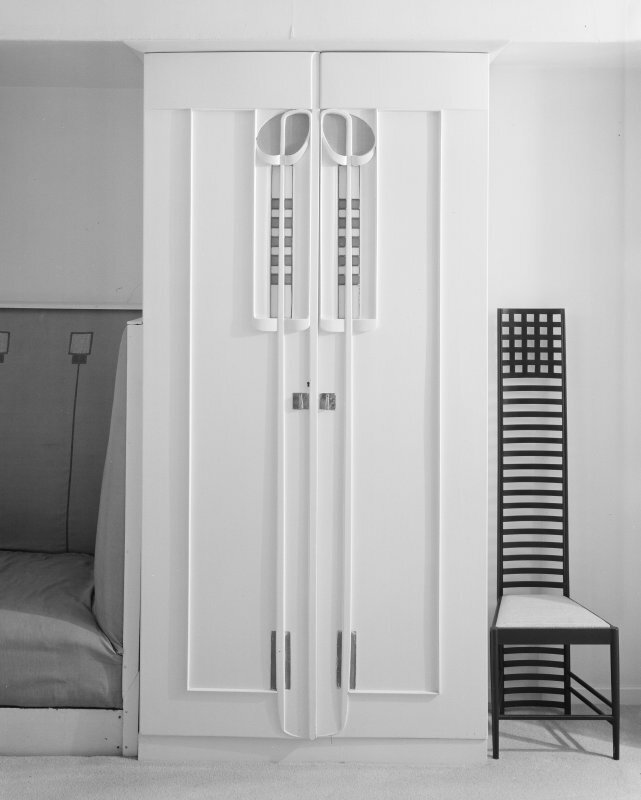 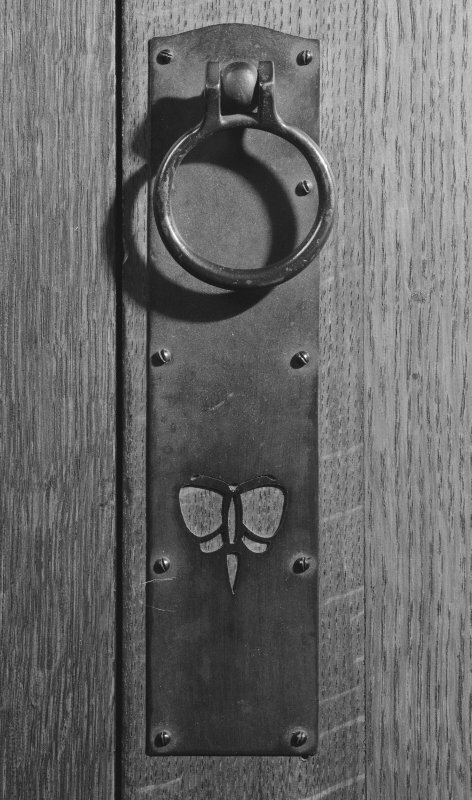 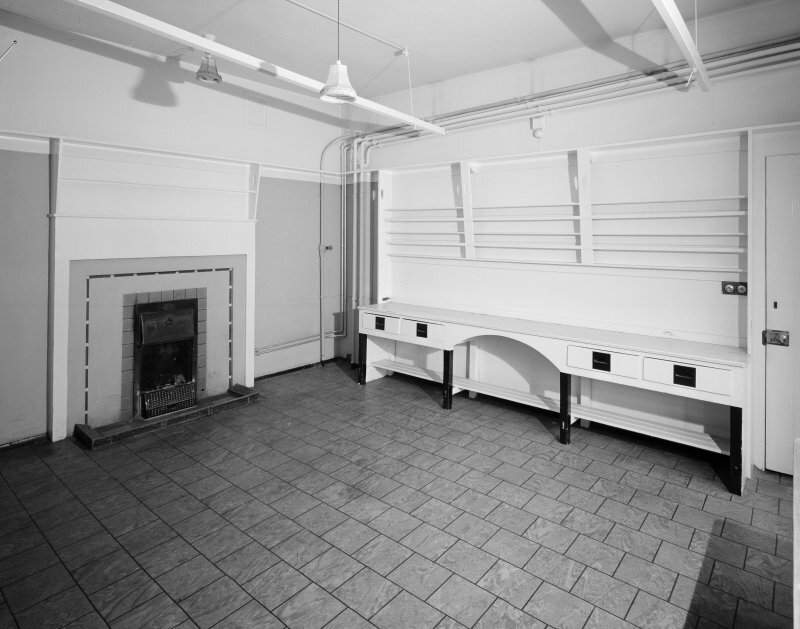 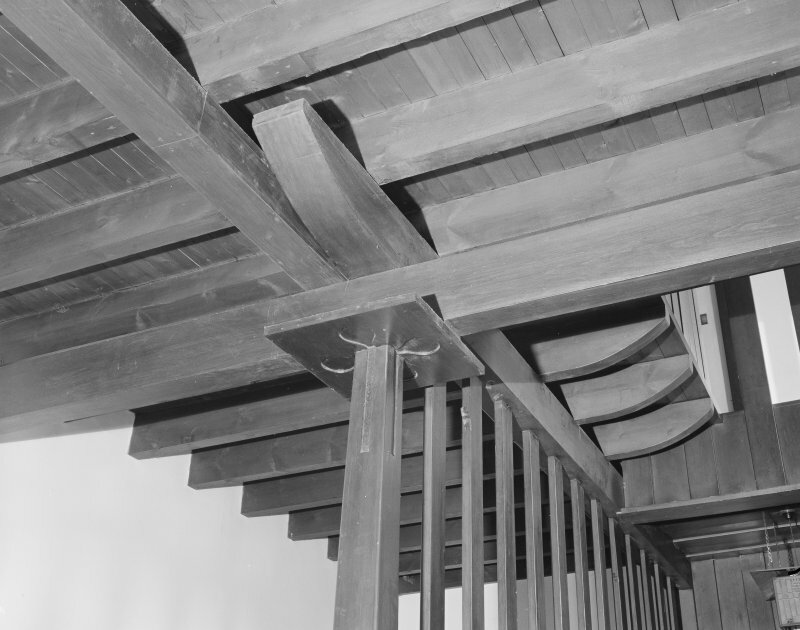 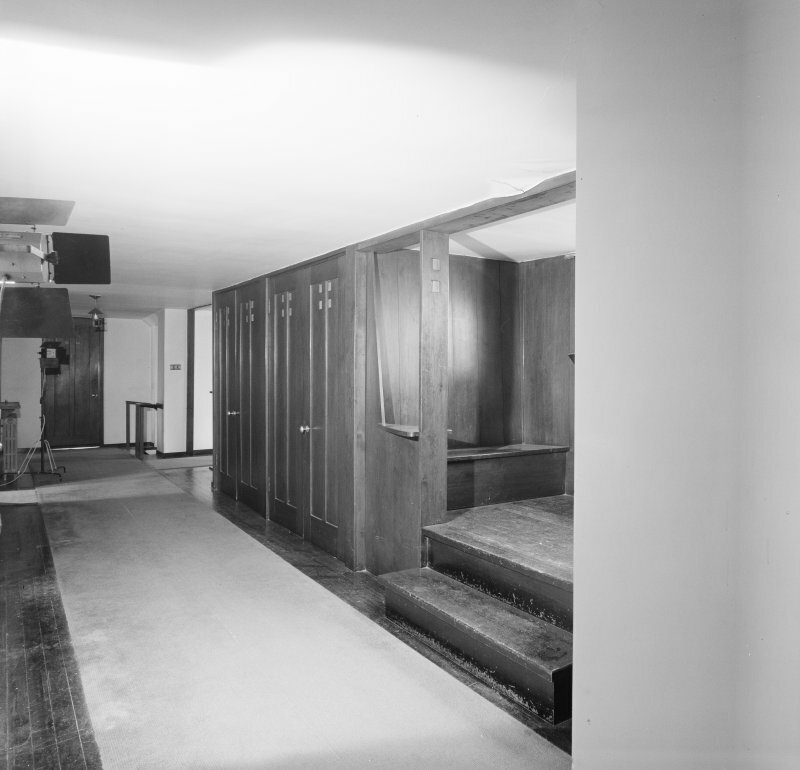 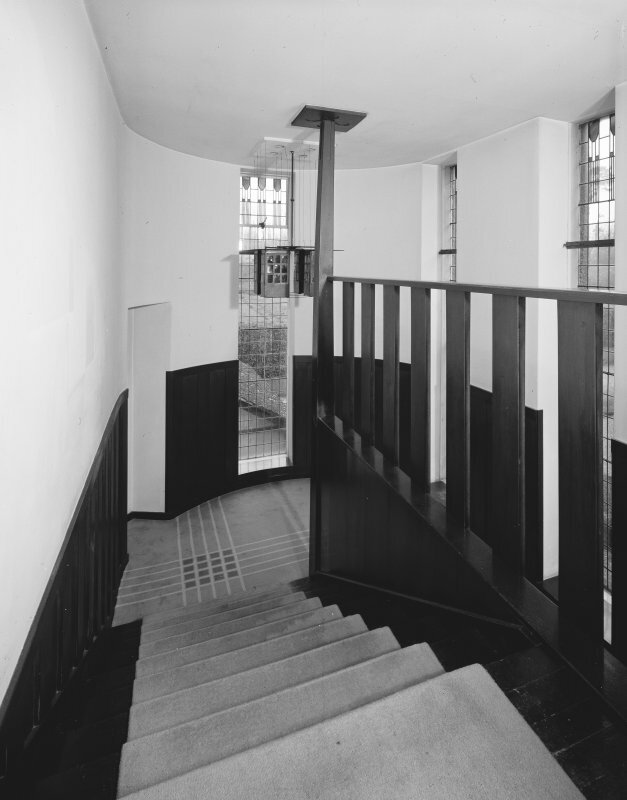 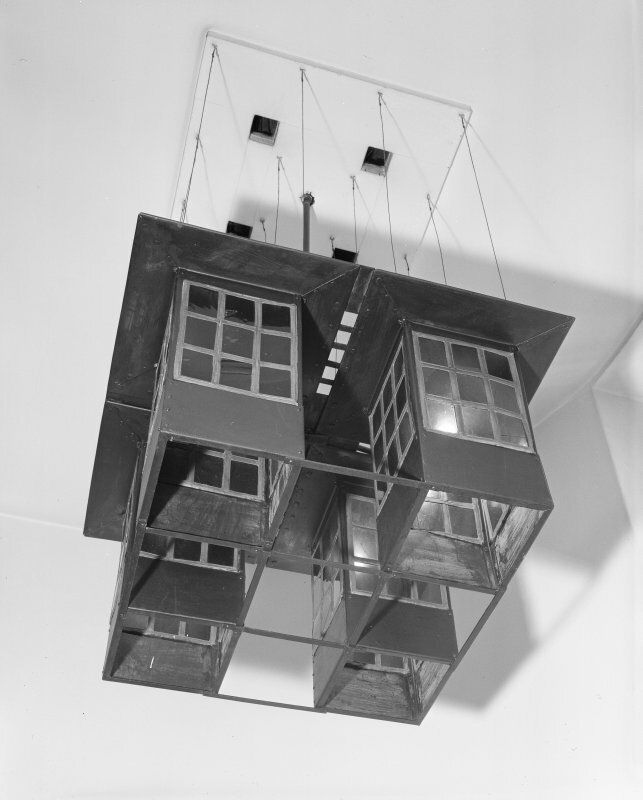 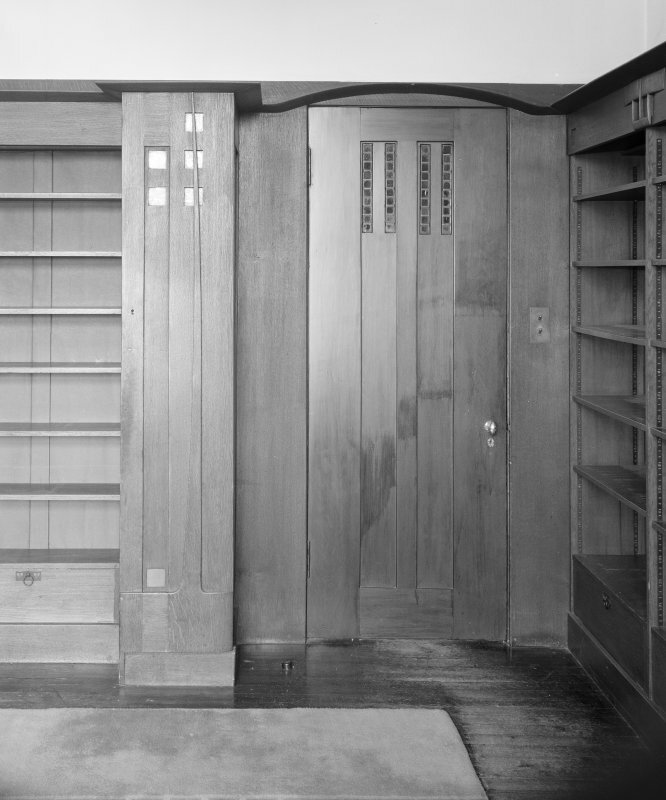 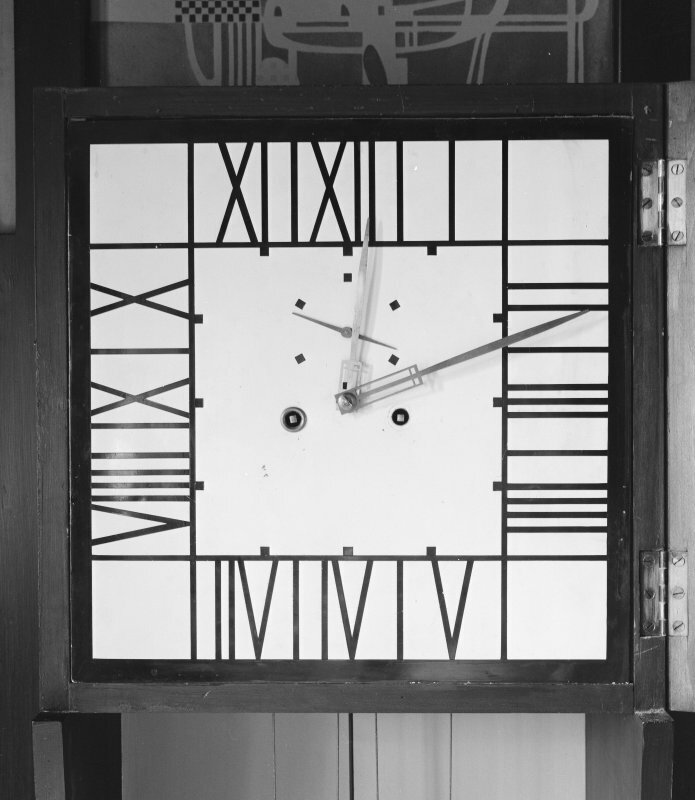 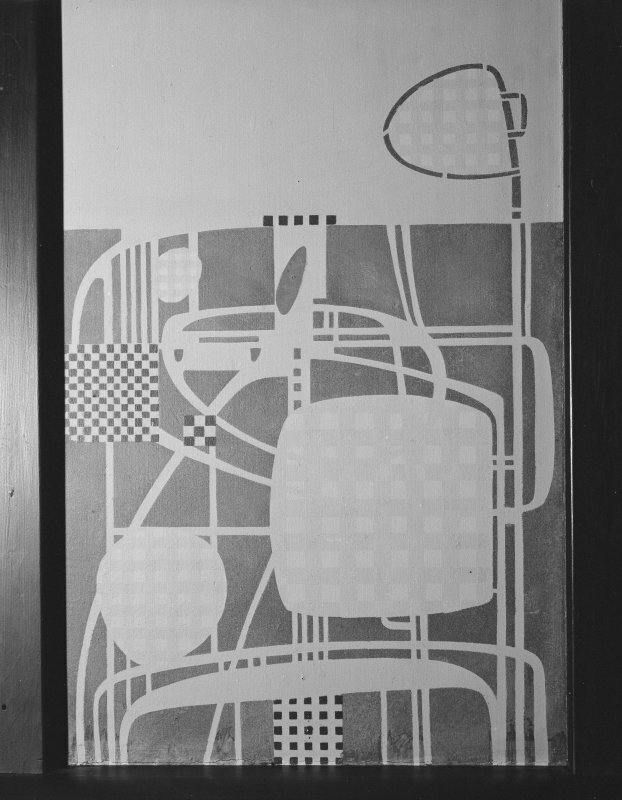 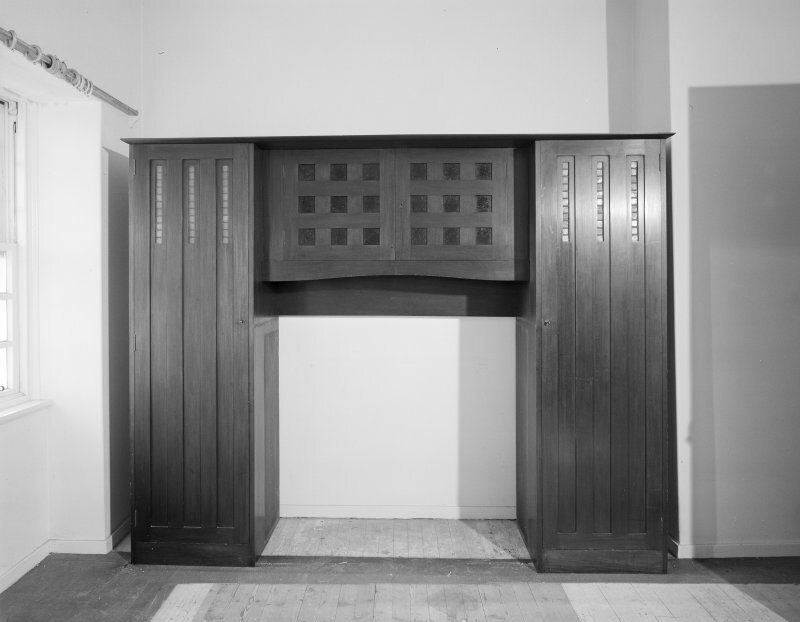 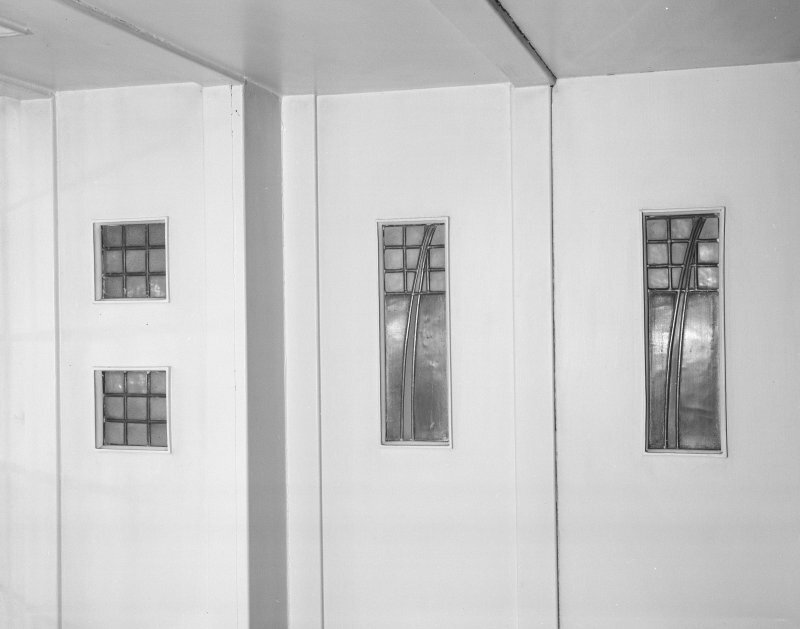 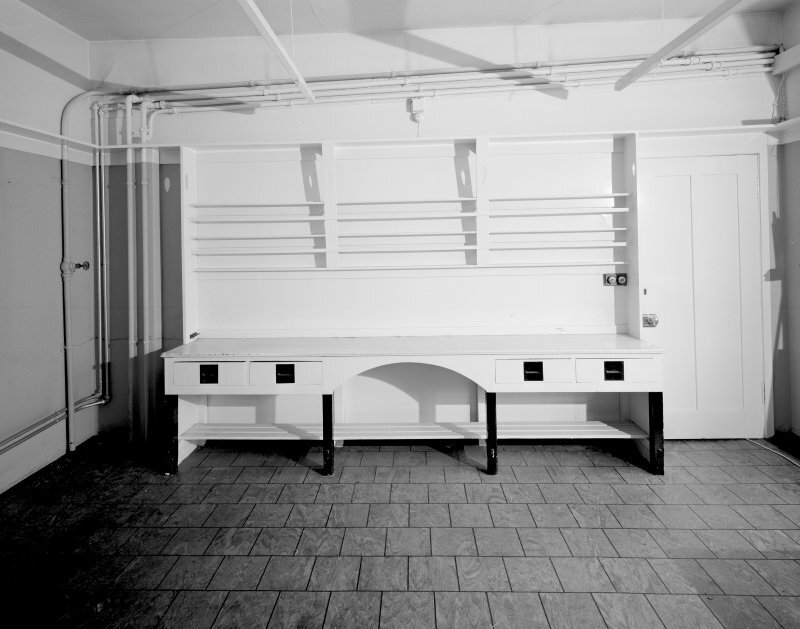 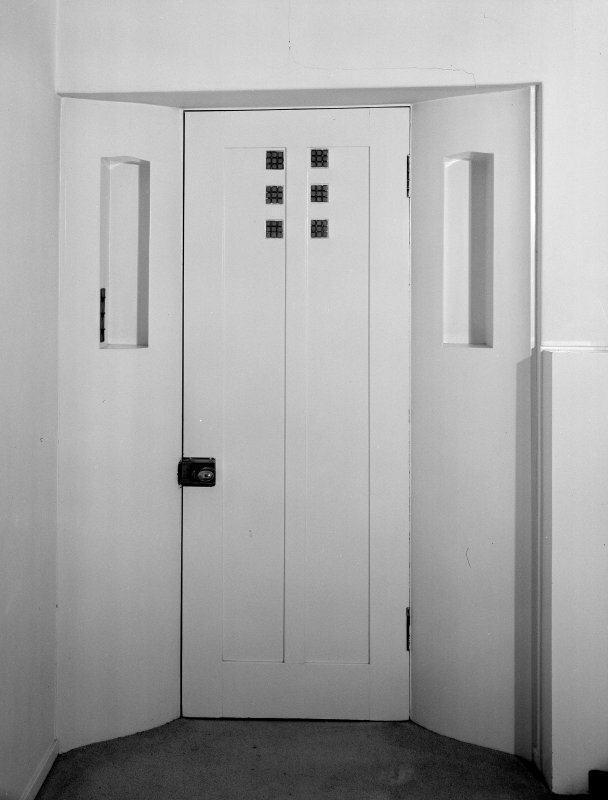 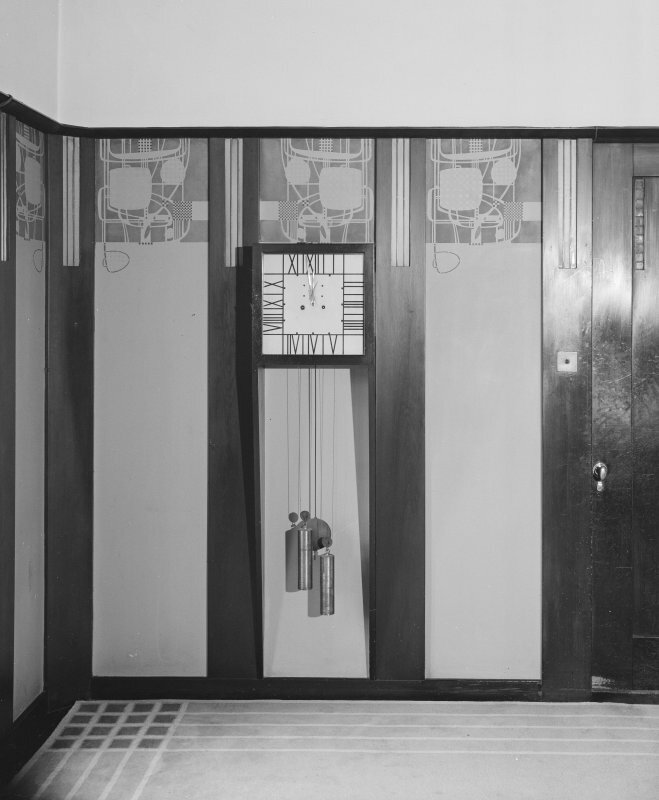 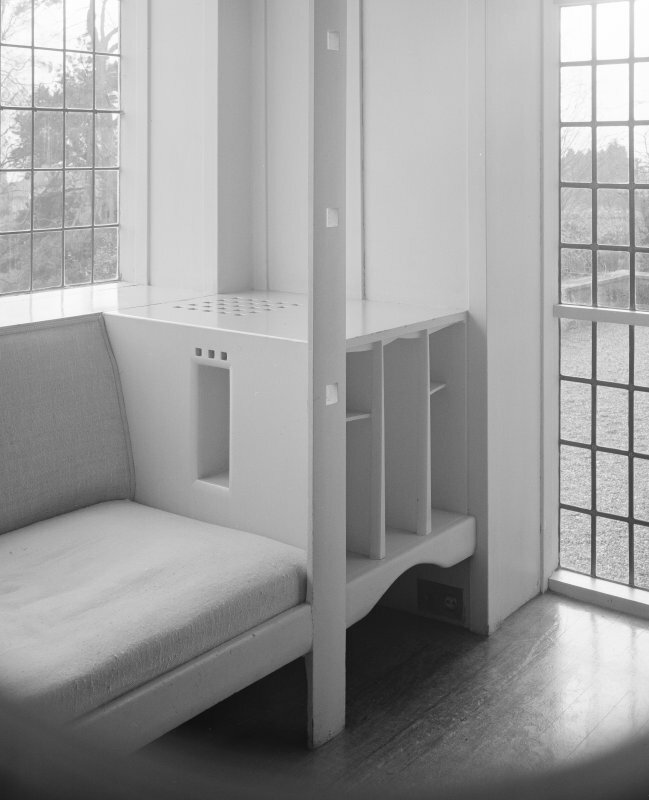 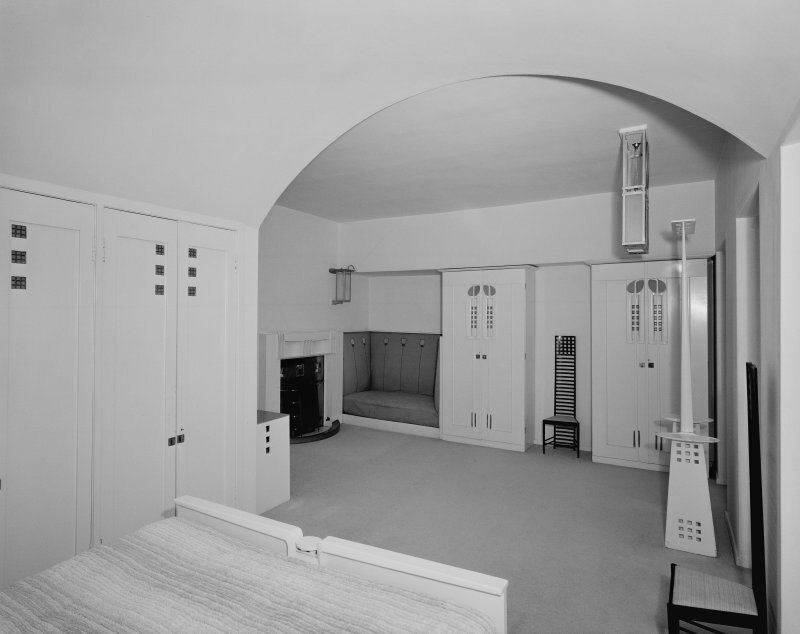 23), the interior is in complete contrast, containing a wealth of decorative detail with the majority of the furniture and fittings also designed by Mackintosh. 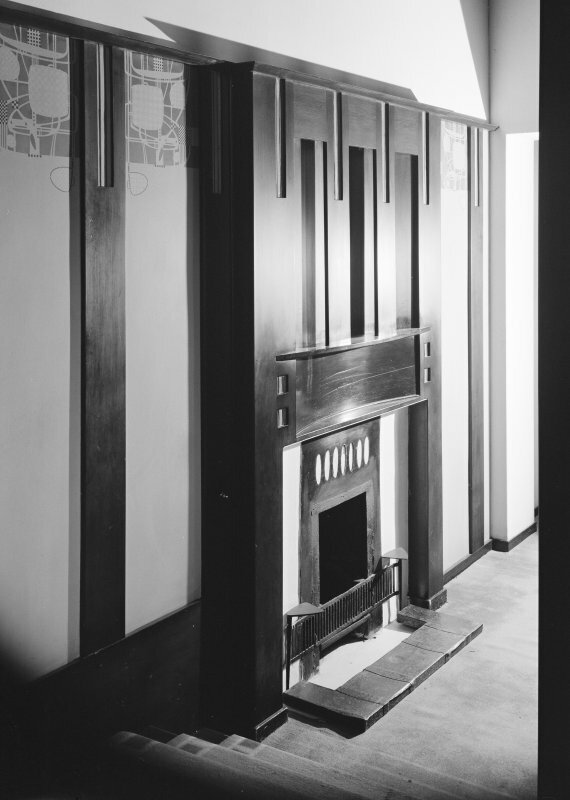 Each of the rooms is carefully composed, using simple overall designs to contrast with geometric patterns and highlighted by small splashes of colour.